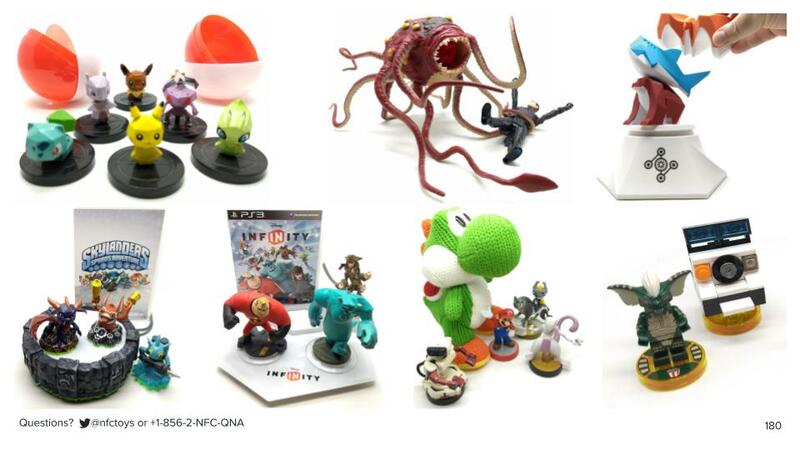 NFC toys are figurines with a built-in near-field communication tag, containing supporting data for games or play. Reading from and writing to these figures is restricted; you can buy the toy, but only special hardware or software can fully use it, not you! 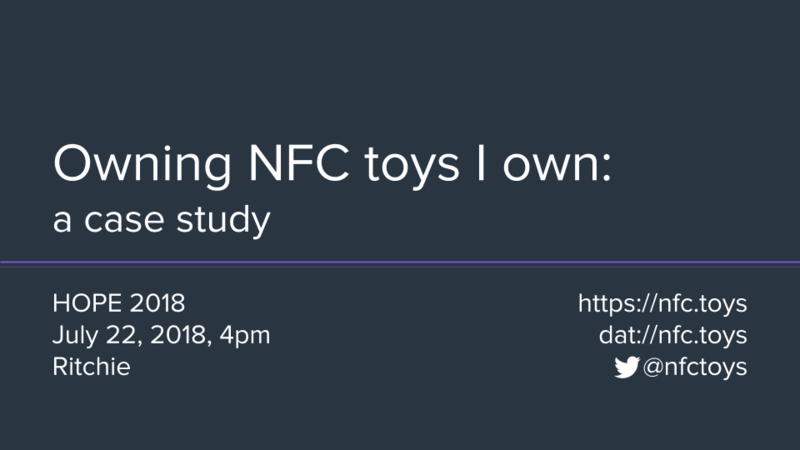 This introductory-level case study will explore the NFC tags found in three makes of toys, using off-the-shelf hardware and software. You’ll see how much can be learned with each different tool, and once read/write credentials are obtained, what some of the legal risks are under the DMCA. Original documentation and code will be presented to generate credentials for any of the three makes of NFC toys, and NFC toys will be distributed for attendees to explore on their own. Before we start, a few points of order. 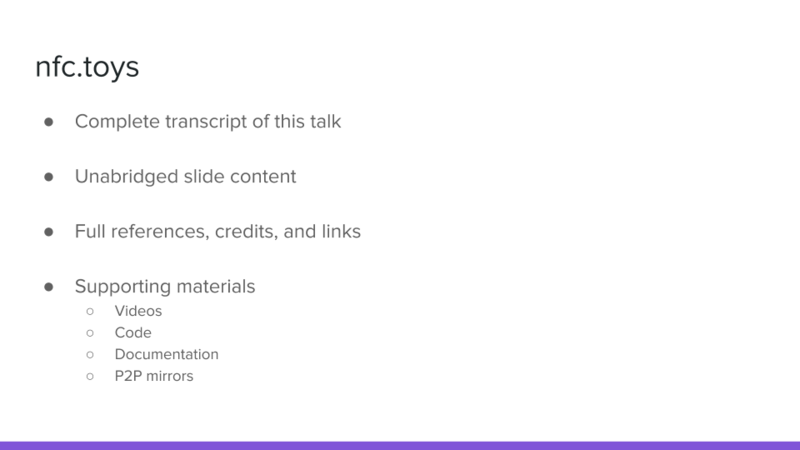 For people watching the livestream or anyone in the audience who would prefer subtitles, the transcript, slides, and supporting materials for this talk are now live at nfc.toys. We're covering a lot in this talk, and it clocks in at just under fifty minutes, which means we don't have time for live Q&A. But, Q&A is important, so I will be taking questions on paper and electronically. 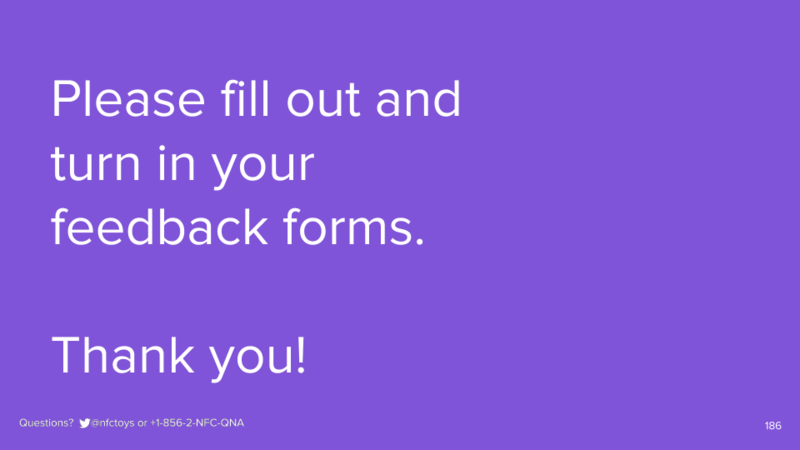 The in-person audience can write their questions on the flip side of their feedback form. 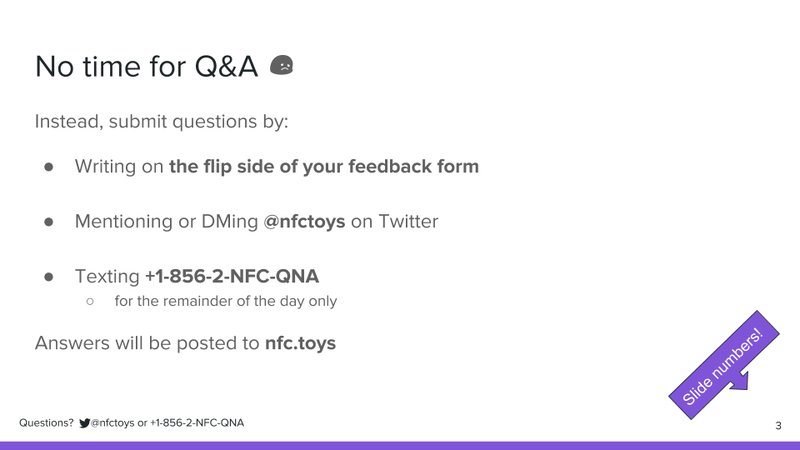 Both the in-person and livestream audiences can submit questions via Twitter to @nfctoys, or via text message for the remainder of the day only to +1-856-2-NFC-QNA. There are slide numbers on each slide you can reference. I will post answers to questions on nfc.toys, and reply to you with a link to your answer. If you're watching this talk in the future, asking questions via Twitter will be your best bet for a response. Being able to do things you want with things you own, even if they have electronics or software inside them, is a core tenet of the Right to Repair, and there was a Right to Repair panel on Friday. Watch the recording of the panel (fast-forward to 48:30). The Electronic Frontier Foundation is suing the federal government over DMCA section 1201 and they also had a panel, Ask the EFF: The Year in Digital Civil Liberties on Saturday. Watch the recording of the panel. 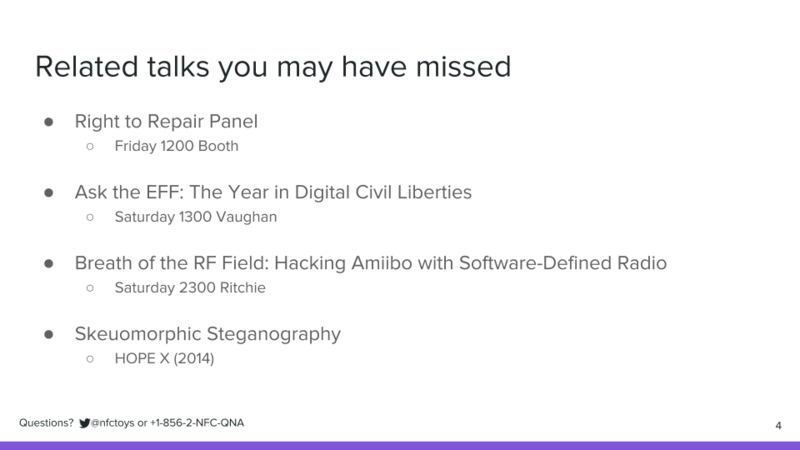 James Chambers presented more in-depth, technical work on Nintendo Amiibo toys in Breath of the RF Field: Hacking Amiibo with Software-Defined Radio on Saturday. Watch the recording of the talk (fast-forward to 12:07:00). In addition, at HOPE X in 2014, artist Joshua Fried put forth the idea that skeuomorphism, often experienced as extreme, historical realism, may offer a natural home for steganography, the practice of hiding messages in plain sight. Likewise, NFC toys offer the ability to store digital content, undetected inside a figurine, stuffed animal, playing card, or box of cereal. Hear more in his talk, Skeuomorphic Steganography. 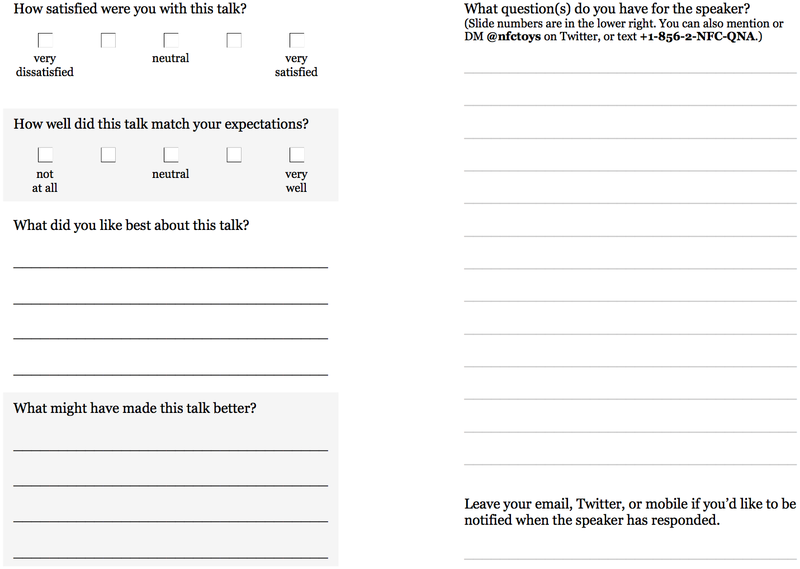 Finally, for the in-person audience, I've provided speaker feedback forms and pens. One side is for Q&A, the other is for talk or speaker feedback. Please fill these out at the end and pass them forward, it helps me understand how this went, independent of any feedback you may provide HOPE directly. If you need paper for your own notes, I've also provided blank index cards, so please use the feedback forms to ask questions and provide feedback. We're going to talk about NFC toys, which are toys, which have NFC tags embedded in them. I want to give you an idea of why this is worth an hour of your time, but I need to start with a couple of examples for everyone who doesn't know what NFC is. or an Android phone with Google Pay? Cool, hands down. NFC is how your phone talks to the payment terminal you hold it up to, and all those wireless payments systems work the same way under the hood. 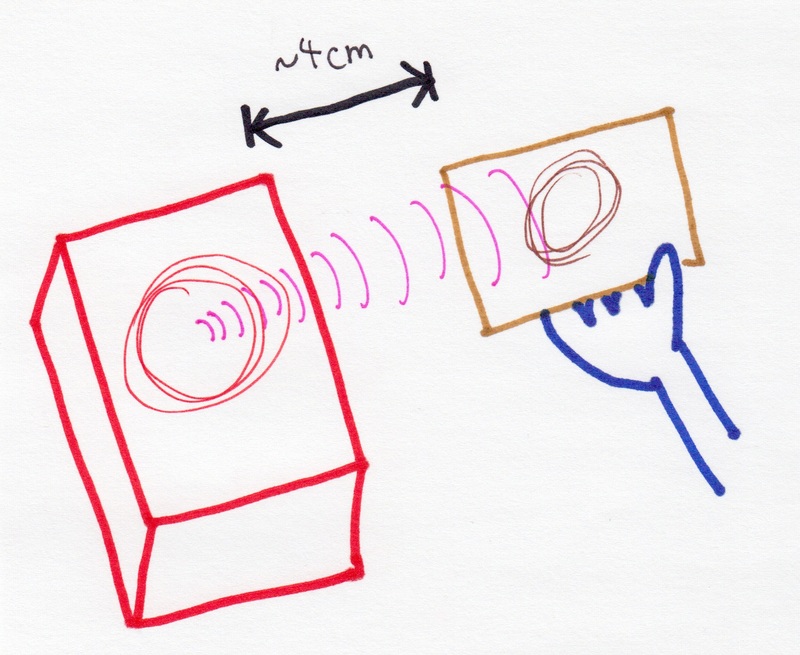 Part of NFC is a standard method of wireless communication. 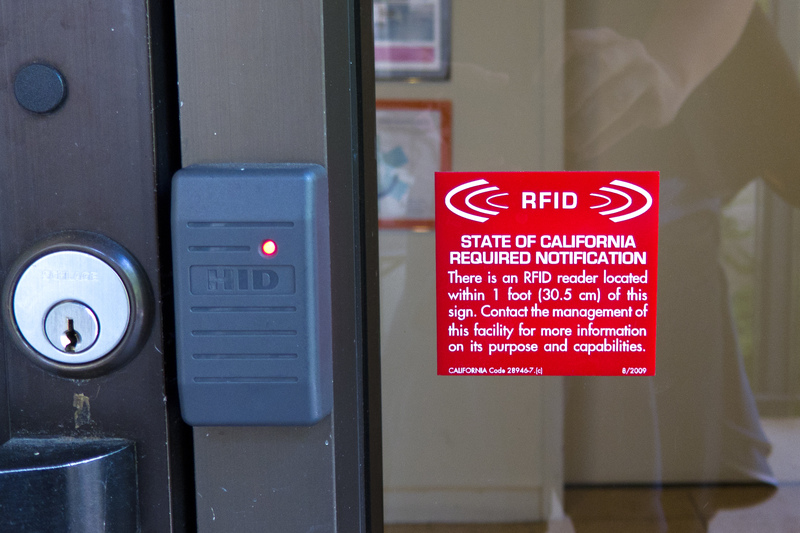 Show of hands, who waves a security badge against a reader to get into their building at work? Cool, hands down. 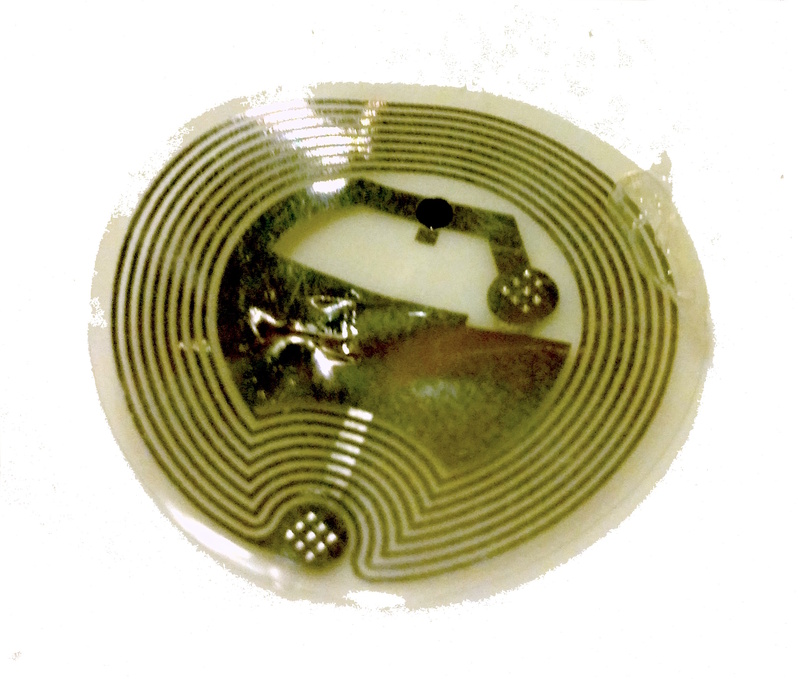 NFC is a subset of the RFID technology that your badge probably uses. Inside that badge, just like inside an NFC toy, is what's called a tag. 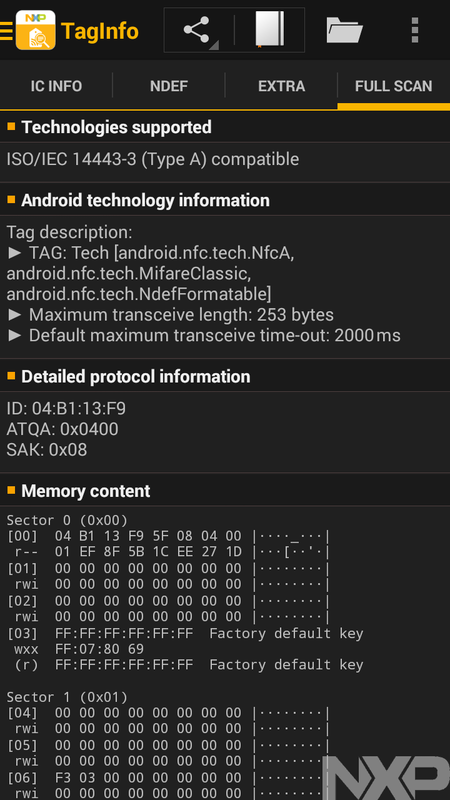 NFC tags are a small amount of memory, logic, and an antenna. They're not really a full-on microprocessor. NFC tags are more like tiny, slow, wireless flash drives. Part of NFC is a standard set of tag types. to allow the tag to communicate back and forth, often just tens to a few hundred bytes. Now, NFC tags which store tiny amounts of data, wireless NFC communication methods to transmit them, these are technical tools for engineers. NFC toys are first and foremost toys. Toys are meant to be fun. Everyone understands that toys are toys, so when a toy does something that a toy wouldn't normally do, that's visually interesting, that's stimulating. Swiping a toy of Samus Aran from Metroid on a subway turnstile? That perks you up, that's super interesting. What other kinds of data could you put on one? Well, anything, because remember, they're like tiny, slow, wireless flash drives. You could have a Maleficent toy holding within it the original curse from the Grimm fairy tale. 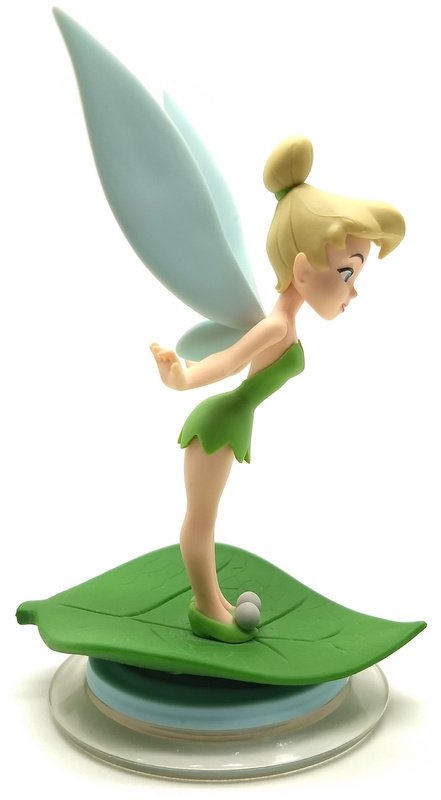 You could have a Tinkerbell toy with a link to the ebook of Peter and Wendy. 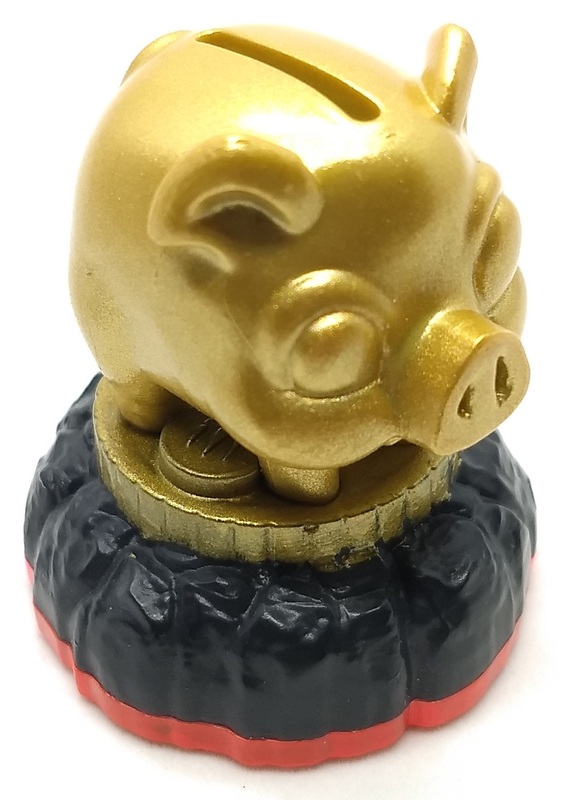 You could have a piggy bank toy with your Bitcoin wallet's private key. You could have a Kylo Ren toy with a playlist of emo songs. You could have a toy car to unlock your real car. You could have a Kickoff Countdown toy store your World Cup predictions. You could have a toy in a geocache, with coordinates to another geocache. 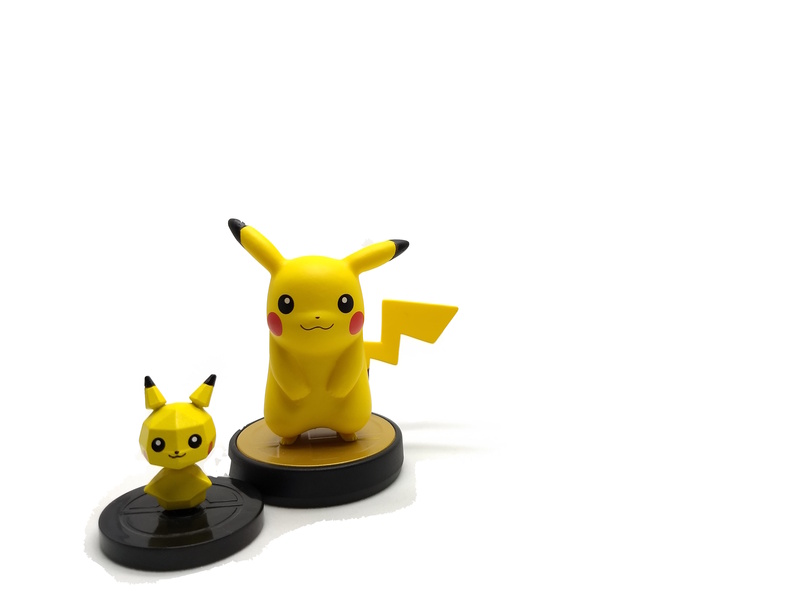 You could have a Pikachu toy with the credentials to your dev environment at work. 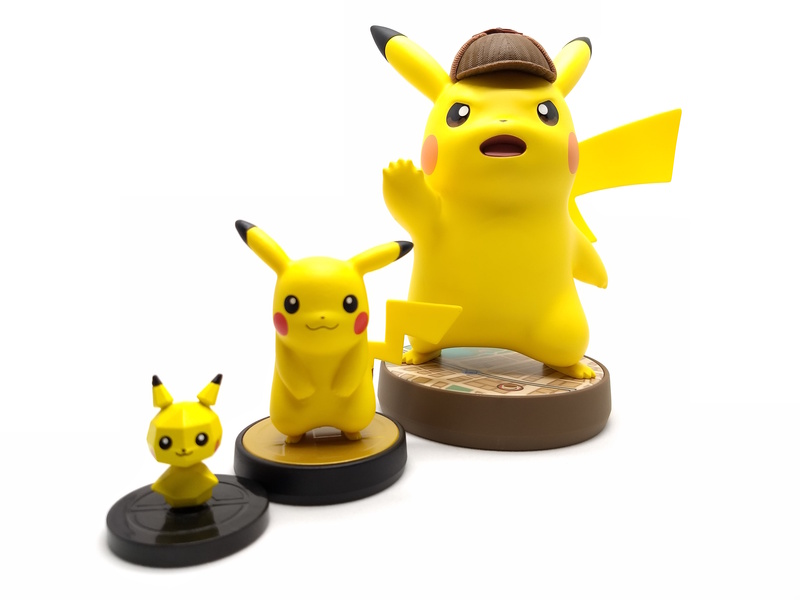 You could have a larger Pikachu toy with the credentials to your QA environment at work. You could have a giant Pikachu toy with the credentials to your production environment at work. Even though they're technically no different than a bare NFC tag, storing the same amount of data in the same way, communicating the same way, the novelty and playful aspect of NFC toys supports us in thinking about unique and fun uses for NFC tags in a way that NFC tags by themselves don't. That said, while they're technically no different than a bare NFC tag, because NFC toys are often intended to support interactions with copyrighted, digital content, they may be legally different if we want to use them for our own purposes. We should be able to play with our toys as we see fit, and it's up to us to assert our rights to do so. There are others makes of NFC toys, and the techniques we'll use can apply to them, but these are what we're talking about today. As we talk about them, we're going to explain how they work, along with some background information about the toys-to-life genre of video games, and pertinent details about NFC tags in general. We'll explore each one with off-the-shelf hardware and software, referencing a long history of security research, and learn how that exploration can lead to determining read/write credentials. 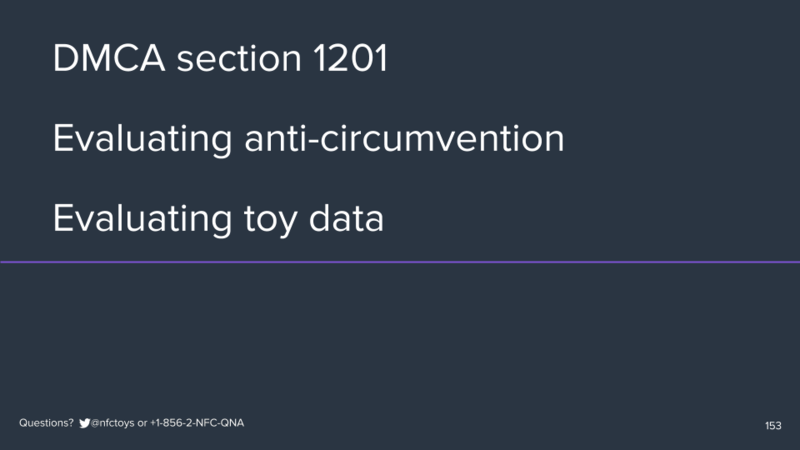 Then, we'll see how to write our own data to those three different types of NFC toy, and talk about the legal implications of doing so. While I will be discussing legal matters, I am not a lawyer, and this is not legal advice. Finally, I'll hand out NFC toys and worksheets for anyone in the audience who wants to try this out for themselves. I hope you will. We're going to start with Activision Skylanders. A show of hands, who has kids who were into Skylanders, and you had to buy them a bunch of stupid toys and video games over the past seven years? Okay, hands down. A show of hands, who was personally into Skylanders, and bought yourselves a bunch of awesome toys and video games over the past seven years? Fantastic, great. 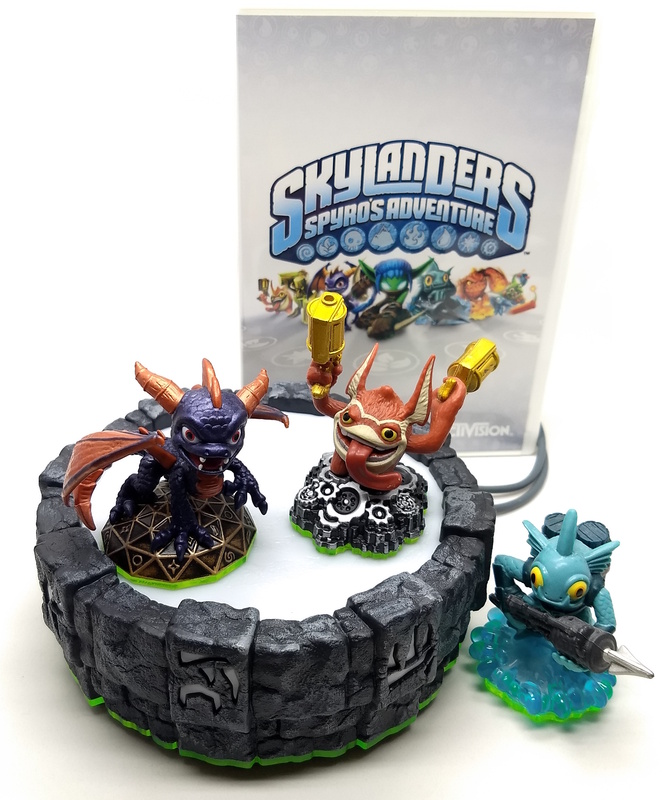 For everyone else who isn't familiar with Skylanders, it's a video game that launched in 2011 as a Spyro the Dragon reboot, across every major platform, plus a Flash-based web game. It's a game in the toys-to-life genre, as in, bring your toys to life. 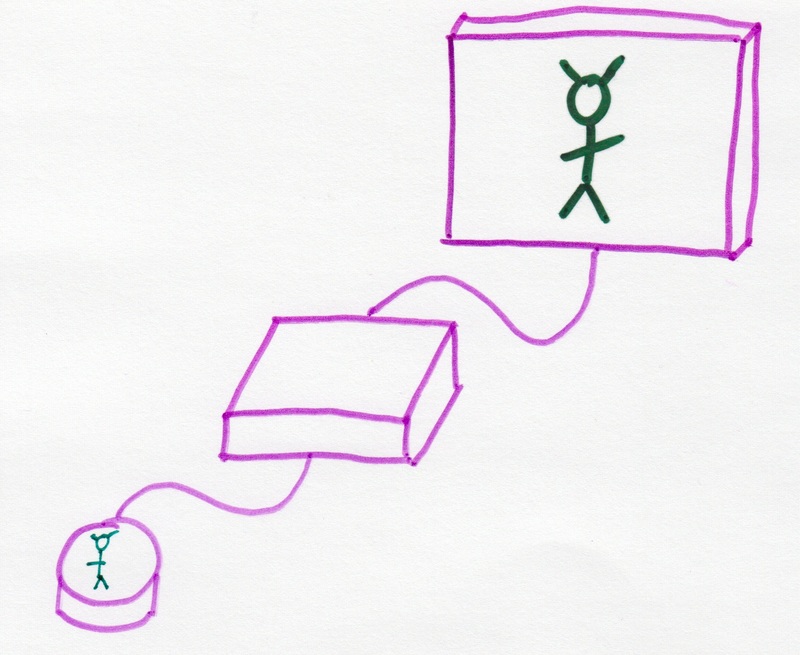 and a USB NFC reader styled as a "portal." To play the game, you place a figure on the portal, and that's the character you play as. 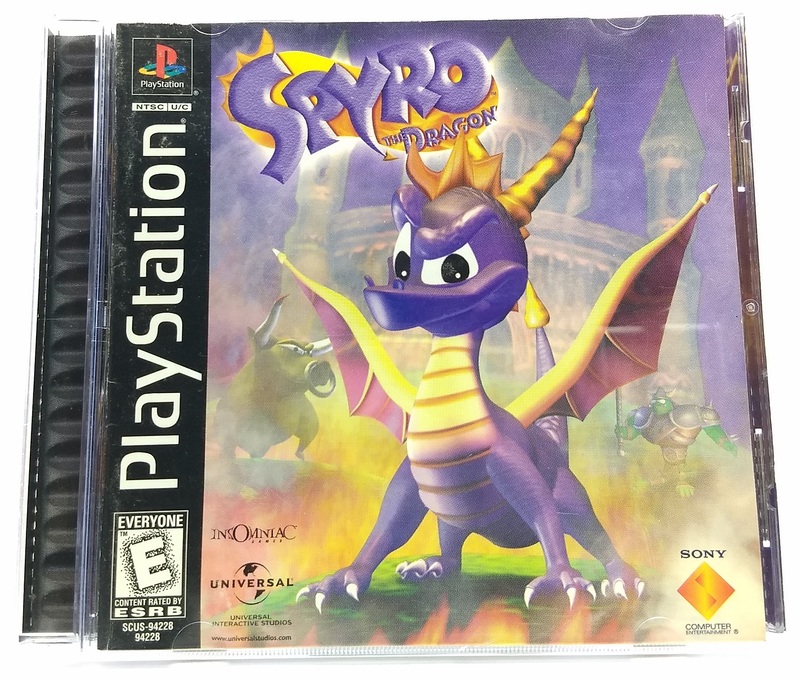 so when you take that same toy to your friend's house, it shows up with the name you gave it, all its points and experience, and all its history. While you can beat the game with what comes in the starter kit, to reach 100% completion, and to collect every achievement, you need to buy additional types of characters and expansion toys. 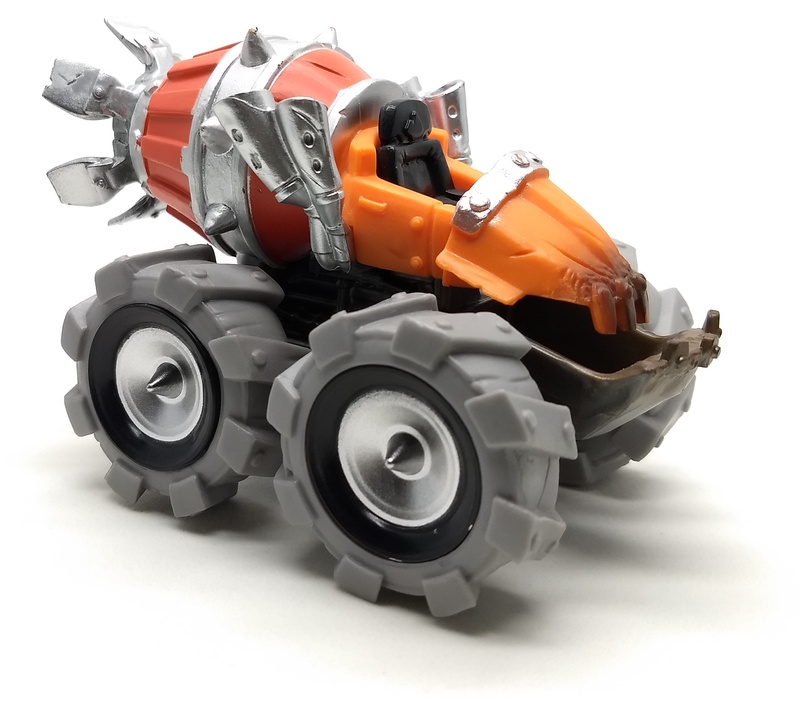 or vehicle figures, resulting in over 350 Skylanders NFC toys of all types. Earlier, we said that some Android phones, ones that support Google Pay, can talk NFC, and so an Android phone will be the first of three standard tools I'll be discussing. 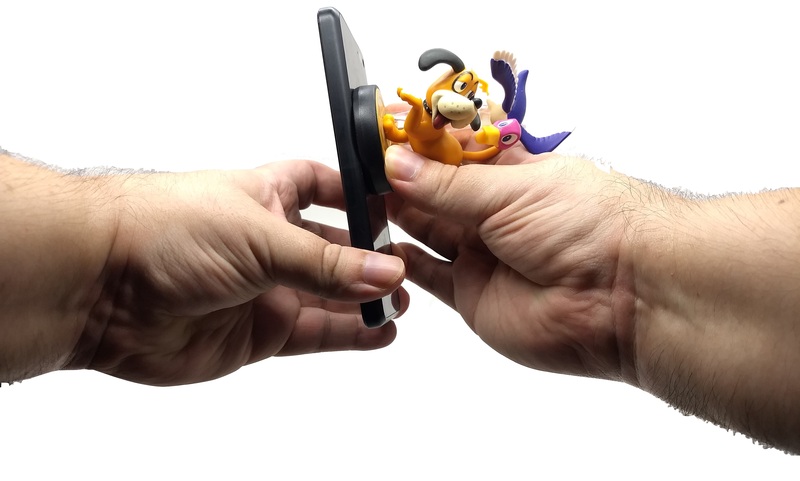 So, what happens when we swipe an NFC toy against an appropriate Android phone? 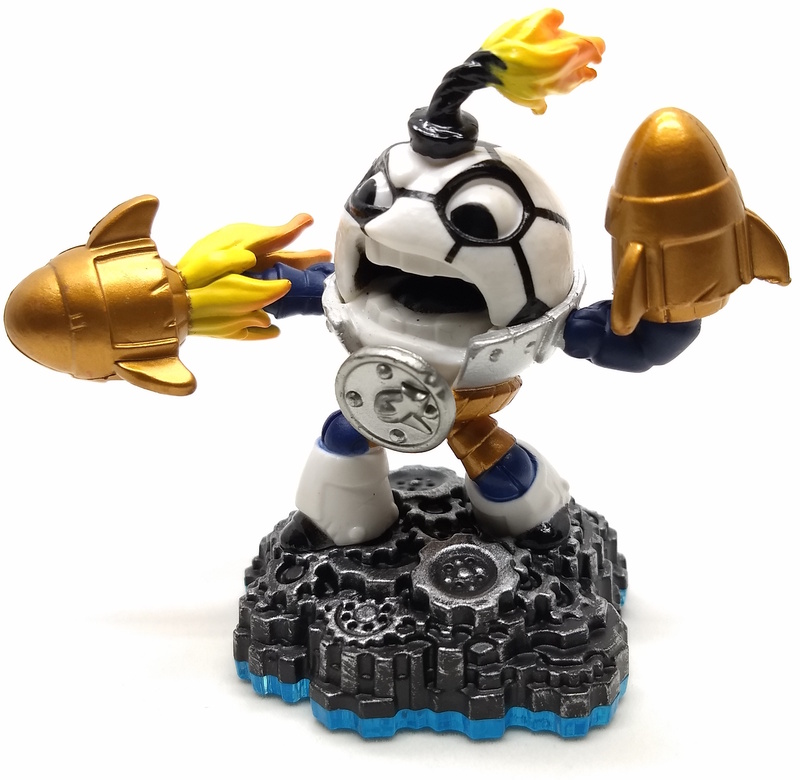 This is a "Ninjini" figure from Activision Skylanders, when swiped against an Android phone with NFC support, running the app NFC Tools. It gives us five pieces of information, as it should. 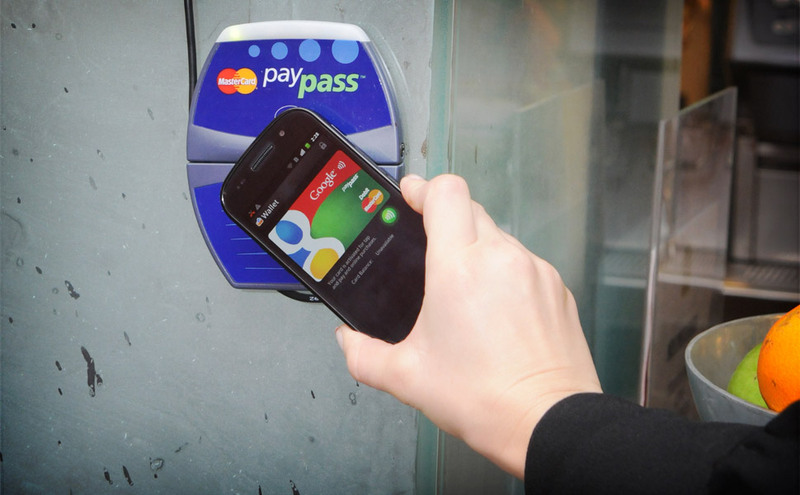 Some of the expected uses for NFC are for things like business cards and advertisements, so some information can always be read from an NFC tag using standard tools, and these represent some of that standard, public information. The first thing we see is it's an NXP brand tag. 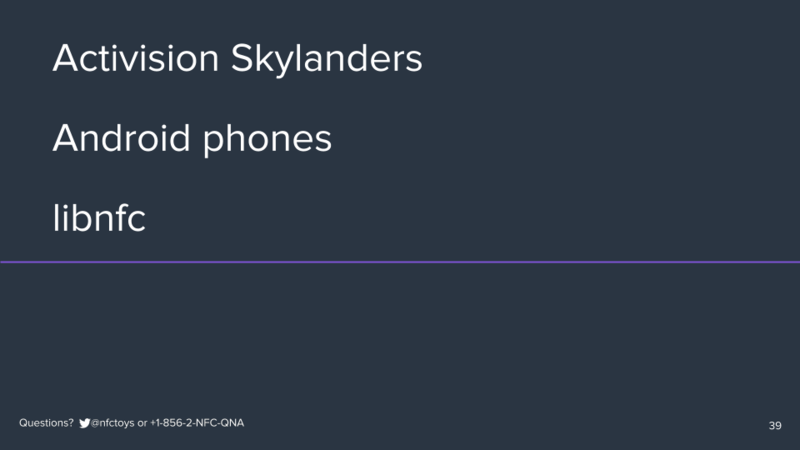 NXP is a major manufacturer of NFC tags, and they've promoted the use of their NFC tags in games like Skylanders since at least 2011. We also see the serial number for the tag, also called the UID, and the ATQA and SAK, which help identify the type of tag it is. Since it's an NXP tag, let's see if NXP's own app, NXP TagInfo, can tell us anything more. So, I gotta say, these screens are kinda empty. 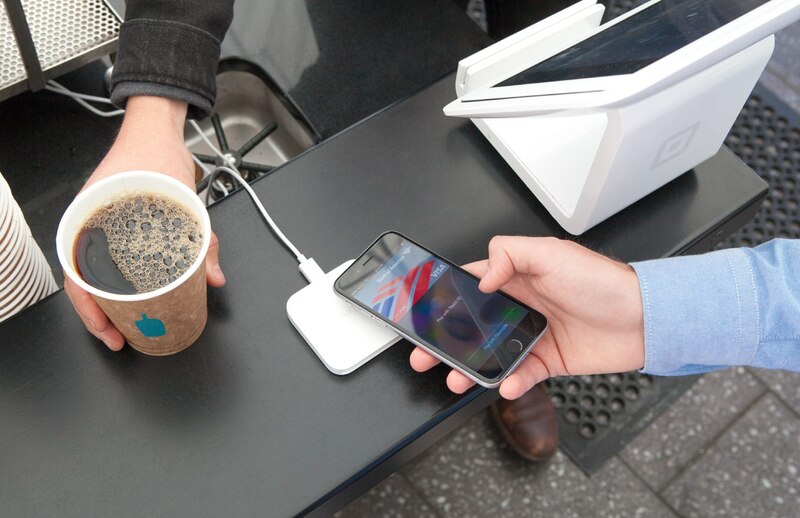 They're not telling us much more than NFC Tools did, and that's actually a little unusual. 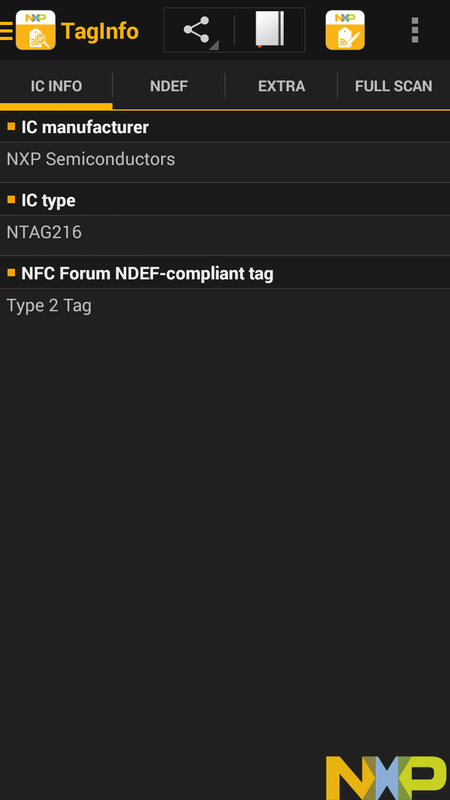 Let me show you what some other NFC tags look like in the same NXP TagInfo app. Here's a payment card for my local arcade. the third one shows us the memory size, which is how much storage the tag has, and how it's set up. 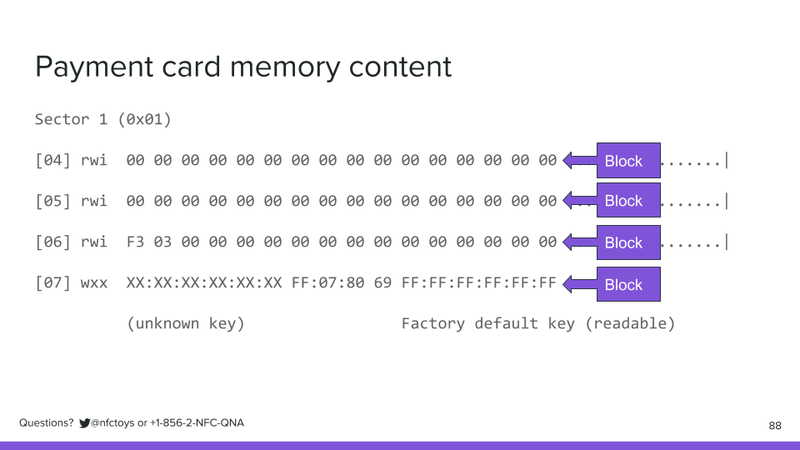 The fourth one shows us the actual data on the card, and it formats it to match up with the description in the memory size. This is laid out just like the data is stored on the tag, in this case, sixteen sectors, with four rows of sixteen bytes each. We can see that because along with the standard, public information that every tag presents, for NFC tags which can be protected, there are also standard keys and passwords that are commonly used, often to allow for public readers, while still restricting who can write to or update a tag. This tag uses a common, standard, factory default key, meaning anyone can see what's on it. 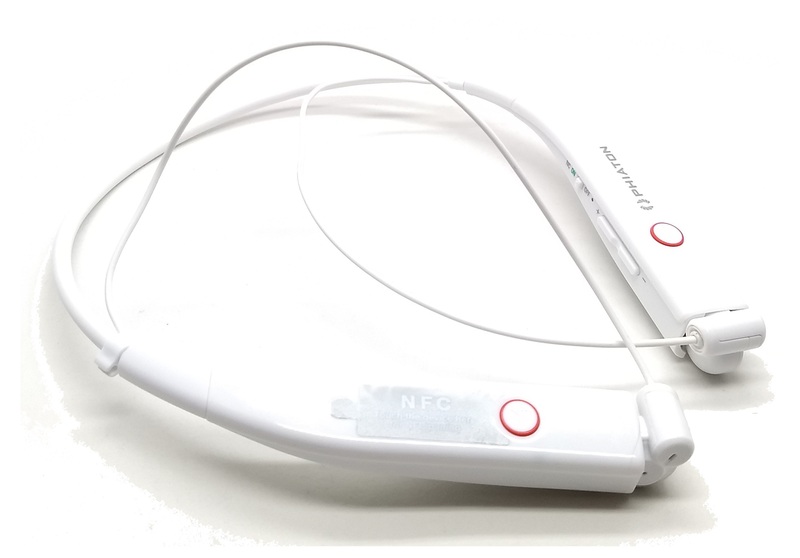 Here's a pair of Bluetooth headphones, which embed an NFC tag for easy pairing with your phone. This one is great, the second screen explains a lot of the technical details of the content, like the manufacturer, the model of the headset, the kinds of Bluetooth protocols it supports, and more. The fourth screen again shows us all the raw memory content that it's getting all that information from, again laid out how it's stored on the tag, in this case in rows of four bytes each, called pages. Unfortunately, "locked and blocked" here means it's read-only, there's no way to write to this NFC tag and, for example, change what it identifies as for pairing. Here is a business card printed by Moo, which embeds an NFC tag to support sharing contact information; sending the user to a URL, app store, or social network profile; or even triggering custom behaviors using IFTTT. 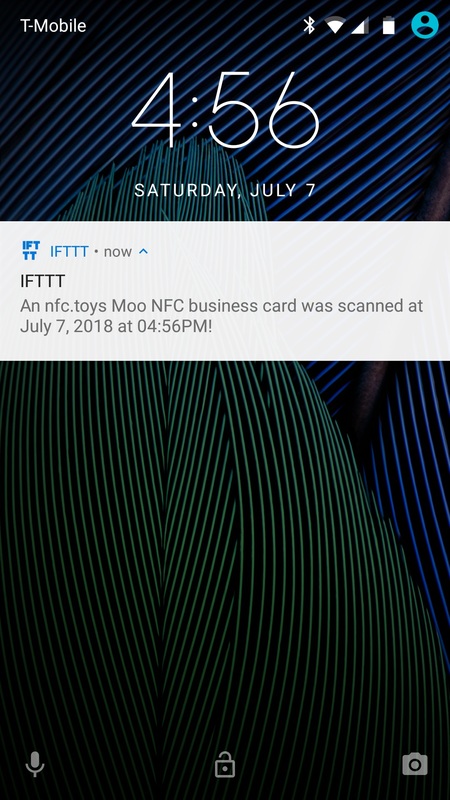 This tag is set up to send a notification to my phone when someone taps it, and then direct them to nfc.toys. This output is also really detailed. The second screen explains the technical details of the content, in this case the Moo URL that provides all the custom functionality through their online service. 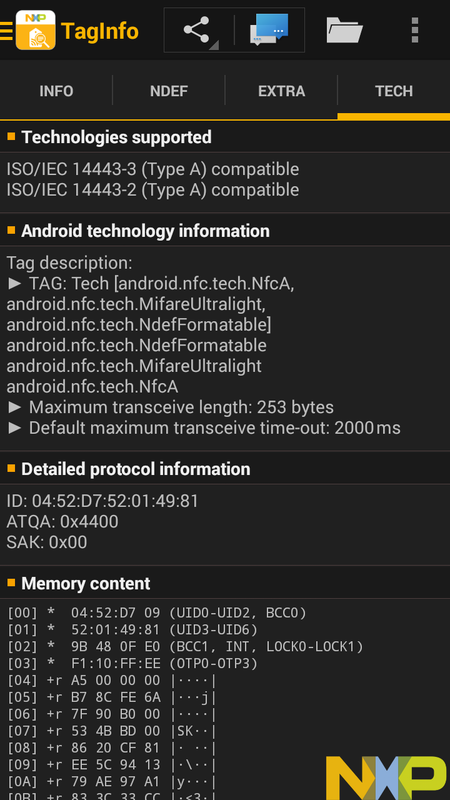 The third screen has detailed information about the NFC tag itself, and the fourth screen again shows us all the raw memory content that it's getting all that information from, again in a pages structure. This entire business card appears writable, meaning we could put anything we want on it, even replacing Moo's online service with our own. Those other NFC tags show me memory contents and the layout of data on the tag, but the TNP3xxx in the Skylander figure doesn't show me anything. But, we know that it has memory, the third tab says so. So, what's up? To figure it out, let's use that elite hacking technique called, go poking around the internet. 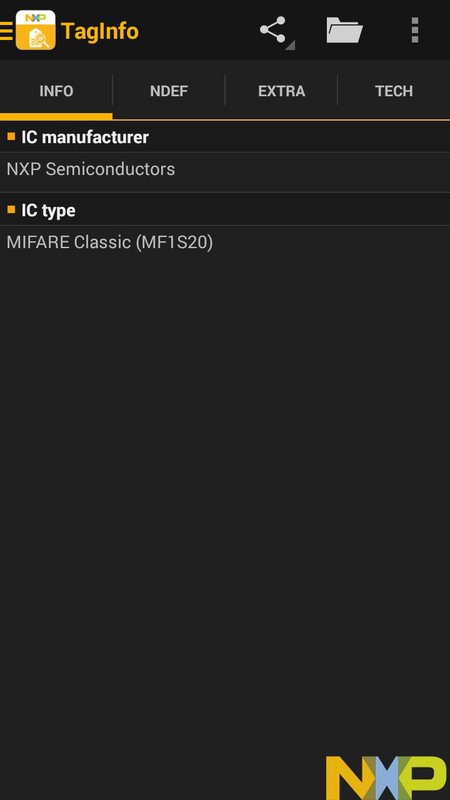 but Table 2 describes another MIFARE tag with 1kB memory, the MIFARE Classic. The MIFARE Classic 1K offers 1024 bytes of data storage, split into 16 sectors; each sector is protected by two different keys, called A and B. Each key can be programmed to allow operations such as reading, writing, increasing value blocks, etc. 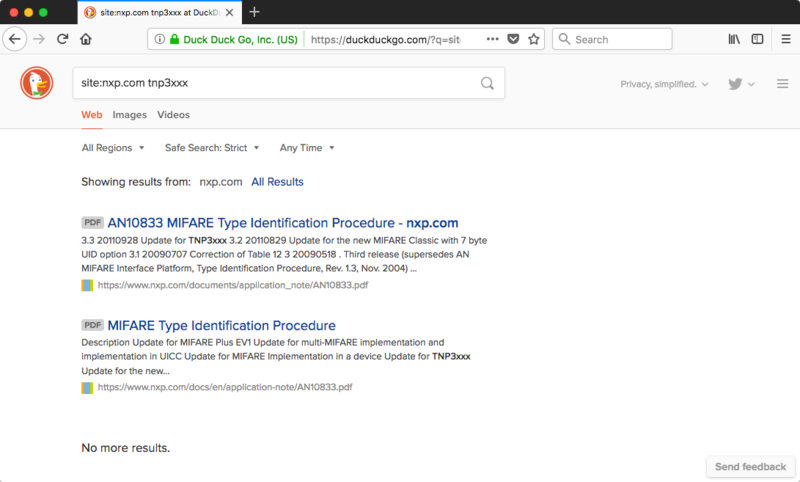 That matches what the third screenshot from NXP TagInfo told us, so maybe the TNP3xxx is a MIFARE Classic-compatible tag, even if TagInfo pretends to not know what it is. 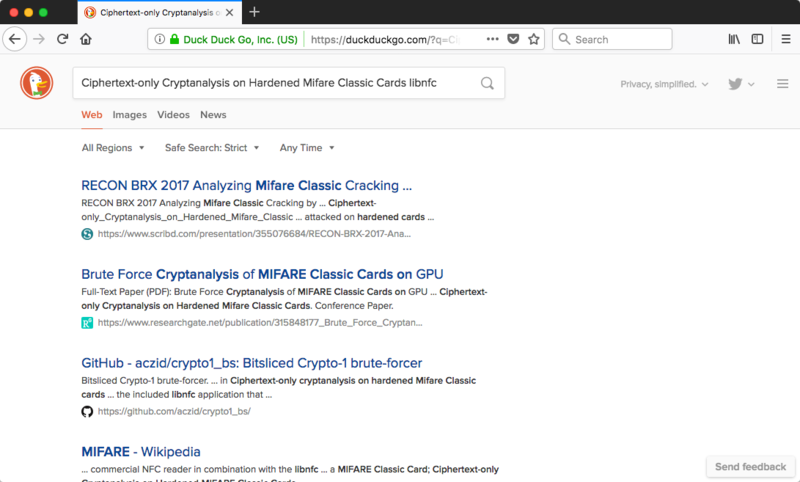 MIFARE Classic encryption has been compromised; see below for details. As a common type of NFC tag, MIFARE Classic is pretty well-explored from a security standpoint. 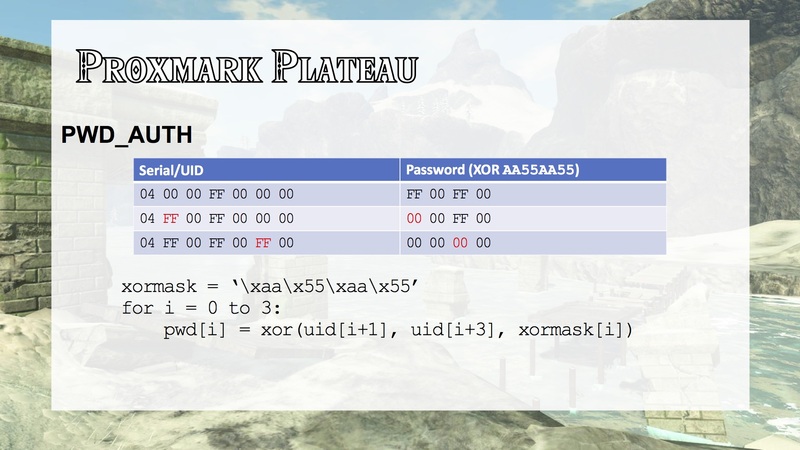 If TNP3xxx is a MIFARE Classic-derivative, could it be vulnerable to the same exploits that MIFARE Classic tags are, allowing us access to the tag? 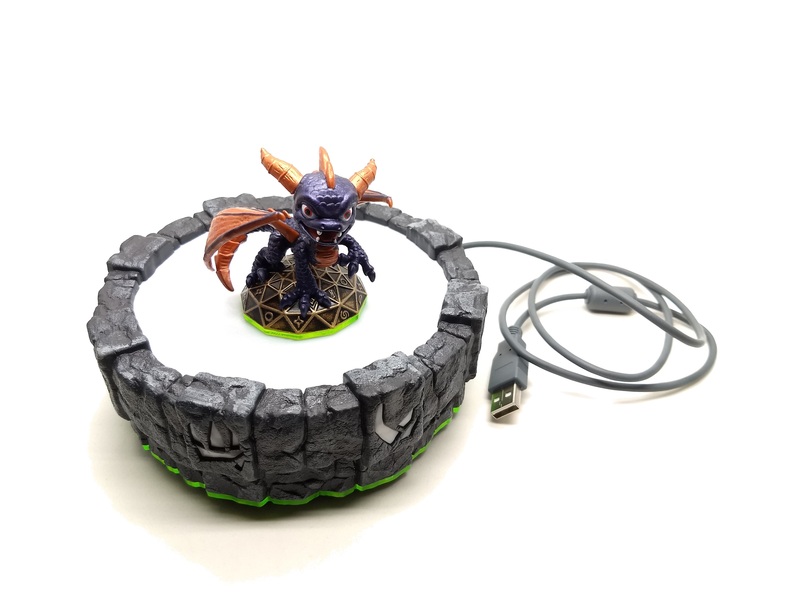 That's as far as we can get on a Skylanders toy with an Android phone, so it's time to upgrade to the second of three standard tools I'll be discussing: dedicated NFC reader hardware plugged into your computer. 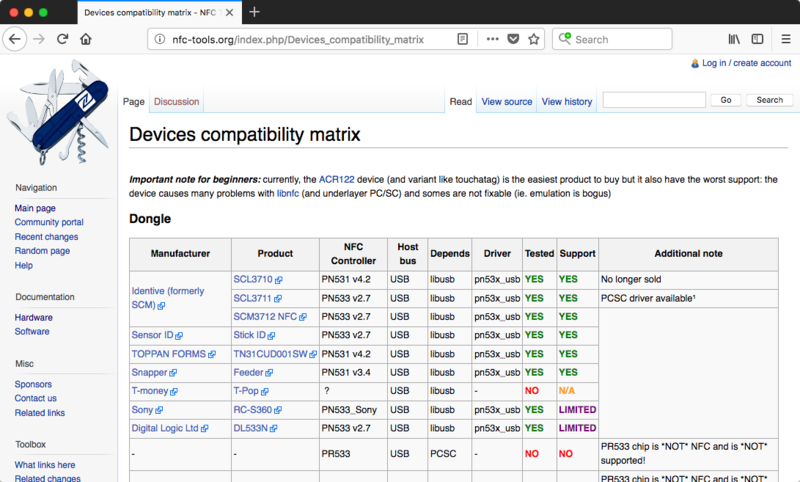 We want to look for hardware that's compatible with the libnfc open-source library, which supports a select range of NFC reader chips on Linux, Mac, and even Windows with some futzing. We want libnfc-compatible hardware, because a lot of the dedicated NFC readers you'll find are Windows-only, or only expose low-level communication functions, requiring more complex, technical programming. 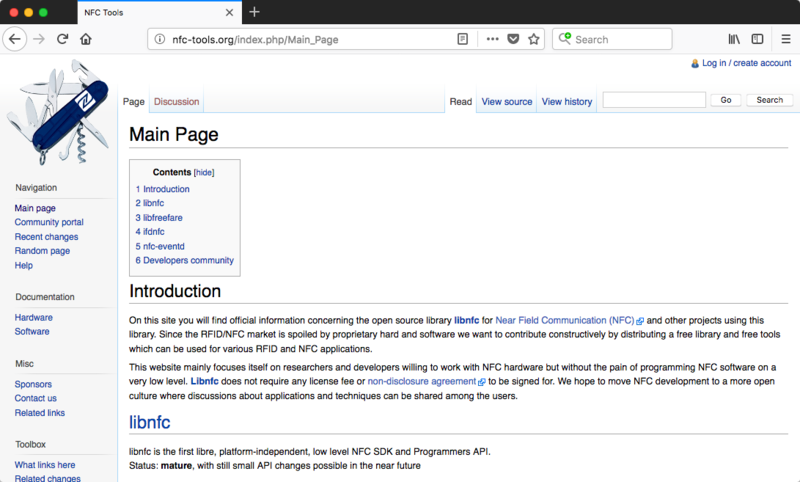 There are higher-level, easier-to-use libraries in various languages which use libnfc under the hood, and so it provides security researchers and hobbyists alike with a standard platform. You can find a libnfc-supported NFC reader for around $50. In addition to a libnfc-supported NFC reader, plugged into our Mac or Linux computer, we'll also need to already know, or be comfortable figuring out, how to compile software ourselves, but we won't need to write anything new. 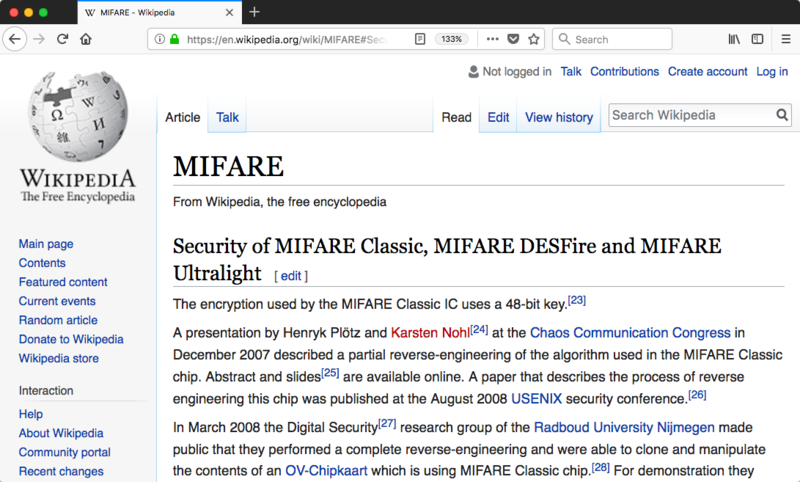 Wikipedia describes something like nine different papers and presentations, starting from 2007, which provide various attacks on and compromises to MIFARE Classic tags. 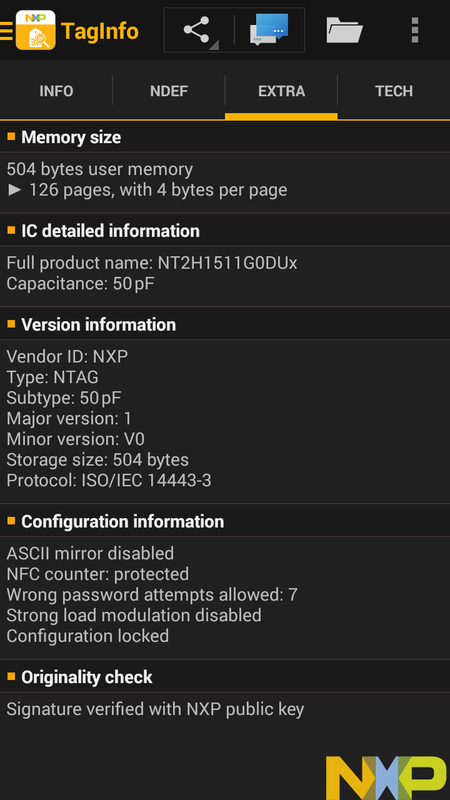 In addition, NXP released updated, so-called "hardened" versions of MIFARE tags "in and around 2011". In exploring this Ninjini toy, we're really just taking the next steps in a long line of scholarship. which finally led NXP to tell people to stop using them. Furthermore, NXP does not recommend to design in MIFARE® Classic in any security relevant application. All you need, is one known key. What's a key? Remember that payment card from earlier, and its memory layout? In this sector from the payment card, the first password, key A, is hidden, unknown, X'd out, which probably means you need it to update the dollar value stored on the tag. The second password, key B, is the factory default key, and it's readable, which means we can see it, and probably also means we can only use it to see what data is on the tag, but not change it. 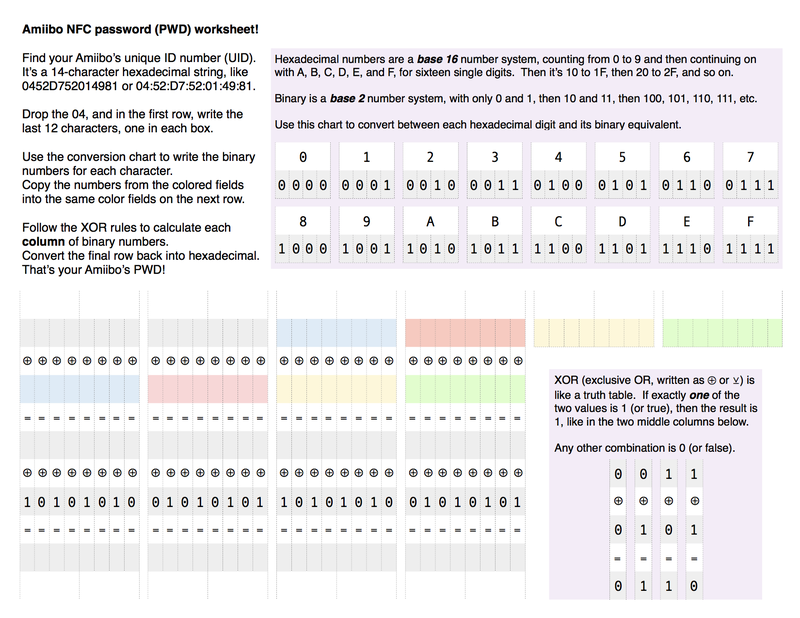 Sixteen sectors, a key A and key B each, means there can be up to thirty-two passwords you need to uncover to get access to a completely locked-down 1k MIFARE Classic tag, but what this paper tells us, is we only need to know one, and due to vulnerabilities in the tag's logic, it can figure out the rest from there. Knowing one in advance is not as difficult a task as it might seem like. Obviously we already know one for this payment card, maybe the TNP3xxx has a similar situation. We could search documentation and source code for common MIFARE keys and try each one of them against the key A and key B for every sector, and, spoiler alert, it'll eventually work, you'll eventually find one. But, this is 2018, and you have slightly newer information available to you than I did when I did that myself back in 2014. Let's head back to the internet to find it. a Masters thesis by Kevin Valk. 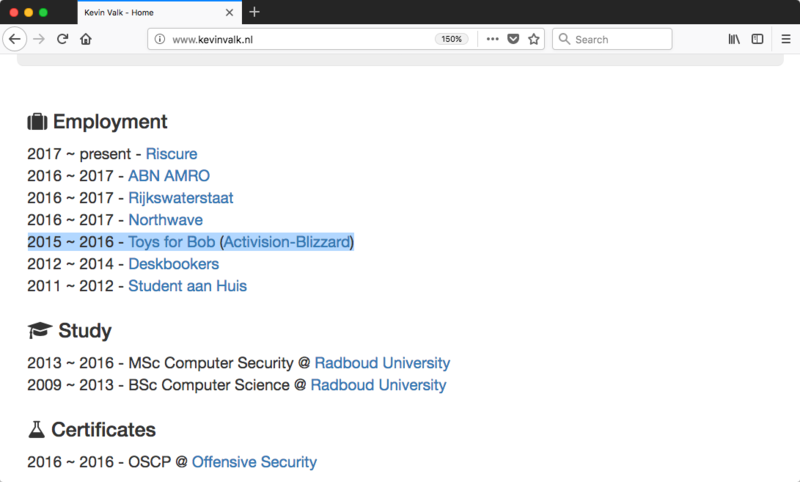 and when you find the author's home page, you also find the fact that he worked with Toys for Bob, developers of Skylanders, for a year. The collected keys showed that the first sector always has the same static key, but all other sector keys were seemingly random. Sector zero key is static and by using the sector one key all other sector keys can be derived. The first key, key A, in every toy is the same. And what does the paper say the first key is? Okay, thanks to two research papers, we have a known key, and we have an attack vector, now we need software to run it that works with libnfc. and a little ways down on the page, we have an implementation of the paper's algorithms suitable for use with libnfc, by security researcher Aram Verstegen. That's a valid key for block 4 (sector 1), and you can repeat that for a block in each of the remaining sectors. That's a valid key for block 9 (sector 2), and you can repeat that for a block in each of the remaining sectors. 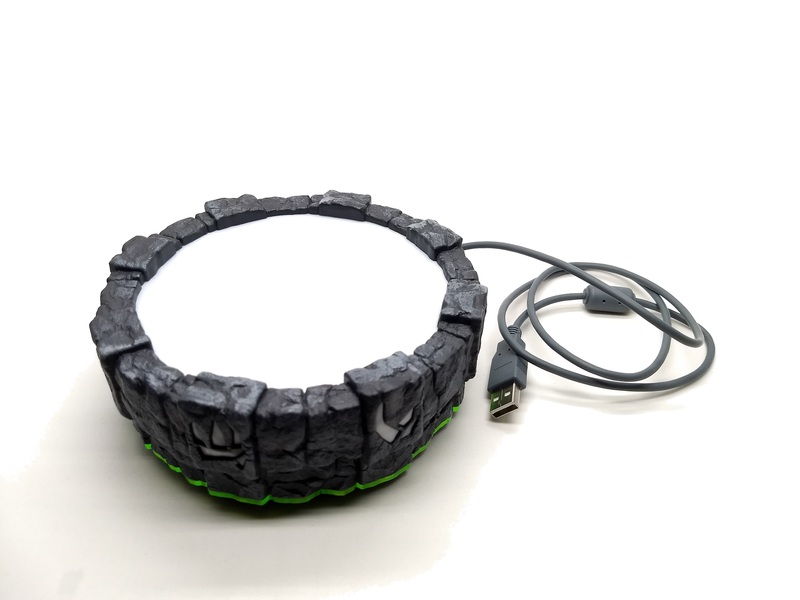 With this, you can get keys A for every Skylanders toy. Just like in the payment card, you can see the access bits on every fourth line. Sector zero, blocks 0-3, has the access bits 0f0f0f. Sector 0, the first four blocks on the toy, is completely read only. Every other sector is writable by its key A. We can't ever read each key A, so we always have to know them in advance. Key B is all zeros, which is a really common password, but it can't do anything, so all it's good for is being used to exploit other keys. for a total of 720 bytes we can write anything we want to. There's one more thing, going back to that quote we pulled from the Valk thesis. For the toys to work as they do, across multiple platforms, and offline, with every key A on every toy being different, there has to be some formula or math that sets them, that the portal or game knows, that has to be based on some fixed, immutable information about the character, like the content in sector zero. So, how do you figure out what that formula is? 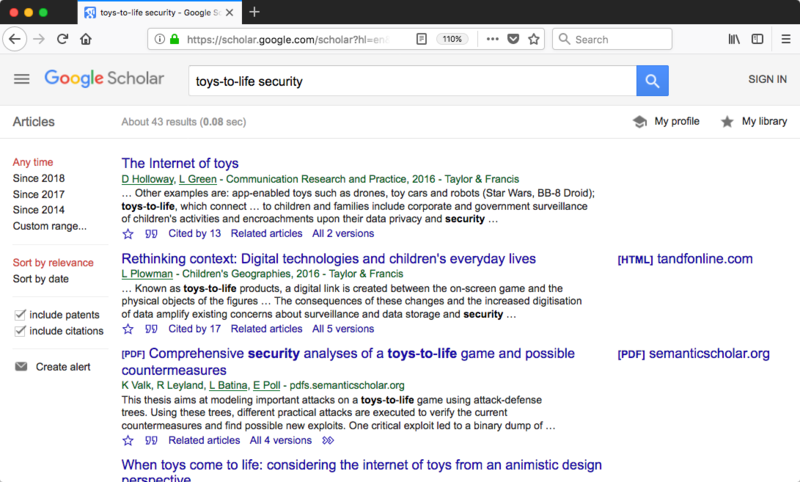 Well, if you're like me, or like the security researchers who eventually figured it out, you buy and crack a lot more toys. As RFID and security researchers discovered across 2014 and 2015, if you collect enough keys, and do some math, you can see patterns in how each sector's keys relate to each other, and come up with more than one method to generate the keys. While certainly not obvious, it feels as if there is some sort of shifting to the left happening. Moreover, when doing an exclusive or operation between a key and the key that follows (K[i] ⊕ K[i + 1]), it becomes apparent that there is indeed some pattern, this can be seen in Table 4. It turns out that K[i] ⊕ K[i + 1] for i in range [2, 16) has the same outcome for every NUID. Sector zero key is static and by using the sector one key all other sector keys can be derived. Verification of this hypothesis is shown in Table 5 and holds for all tested NUIDs. However, the sector one key is the only exception as K = K ⊕ (K ⊕ K) does not hold across different NUIDs. Valk's thesis even included the fact that patterns in the keys could be discovered, documenting that there were patterns, but he did not go so far as to document what the patterns meant. 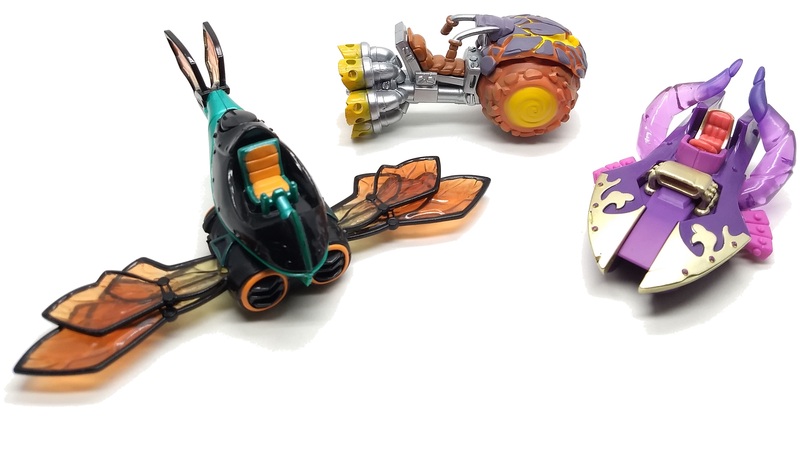 So, today, I present the first, public, clean room description of an algorithm to generate the keys A for all Skylanders figures released to date. 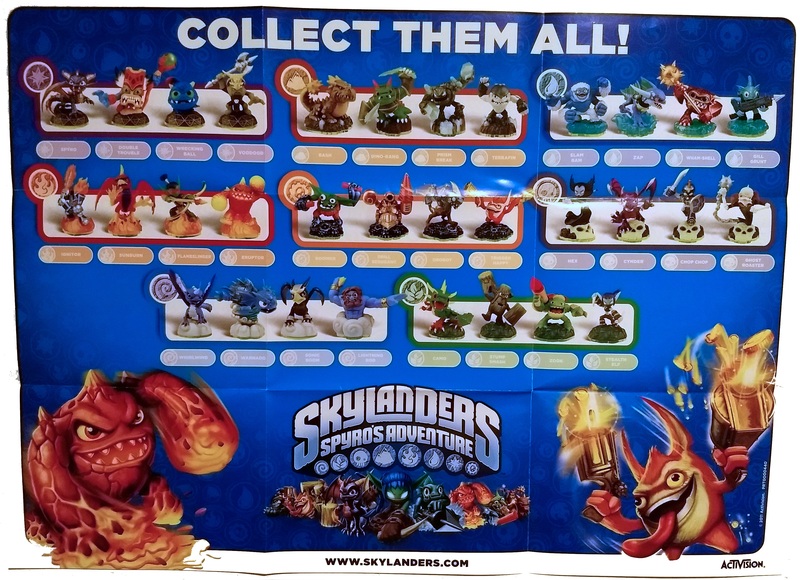 I'm publishing this to support new interoperability of Activision Skylanders NFC toys. 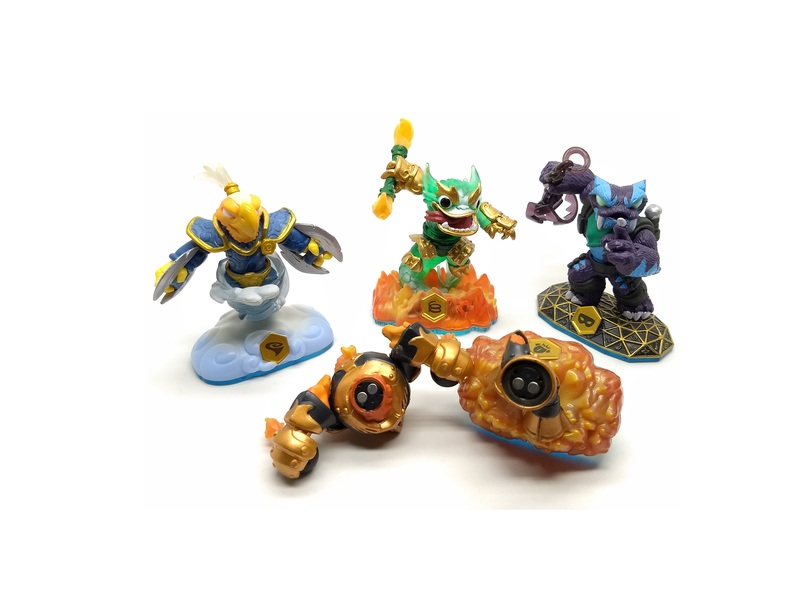 By knowing an algorithm used to set the read/write passwords (keys A), we can interoperably read/write our own data to a Skylanders NFC toy, using our own NFC hardware and software, without tedious manual cracking on a per-toy basis. 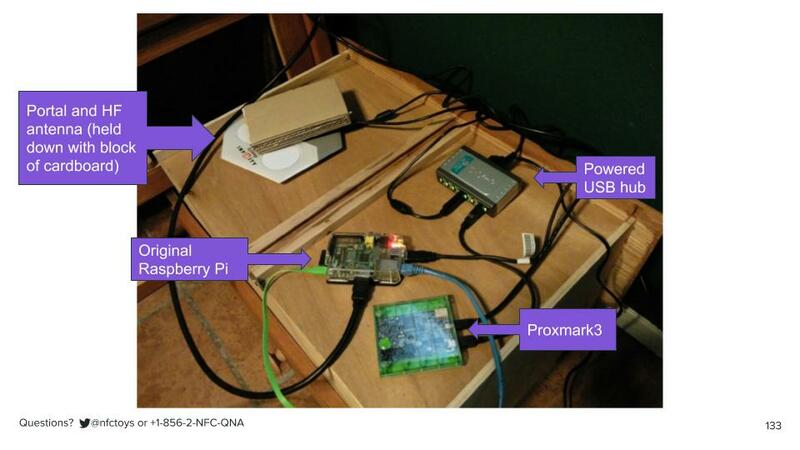 On nfc.toys, you'll find a video showing me writing custom data using a Mac with an off-the-shelf USB NFC reader, and reading that custom data back out with a Raspberry Pi, using an off-the-shelf, NFC add-on. 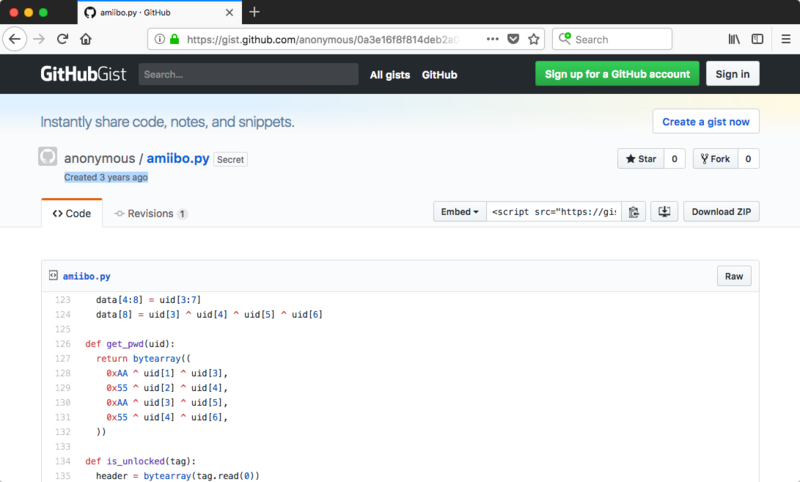 You'll also find a sample implementation of this algorithm in Python 2. We're set for Skylanders. Let's talk about Disney Infinity next. 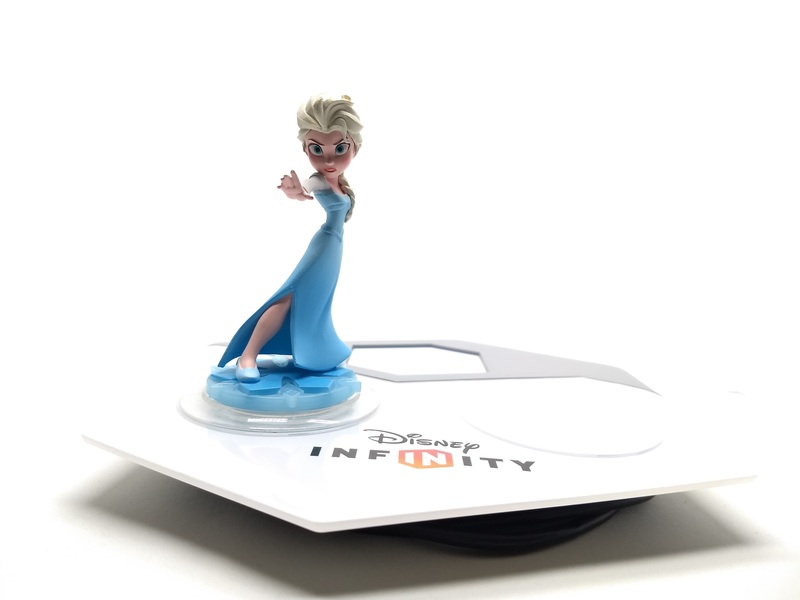 A show of hands, who has kids who were into Disney Infinity? and was devastated, as I was, when they canceled the series? 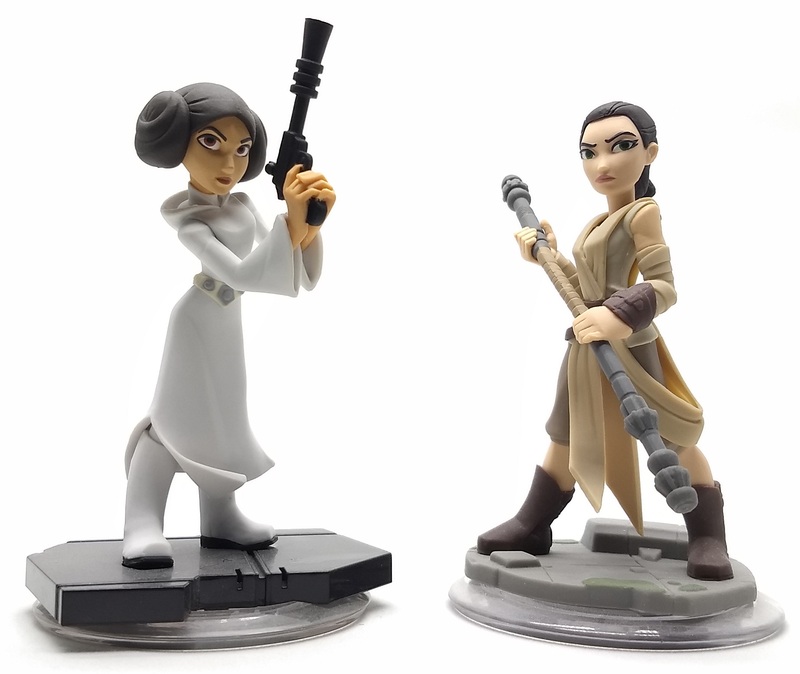 For everyone else, Disney Infinity was Disney's entry into the toys-to-life genre, launched in 2013. 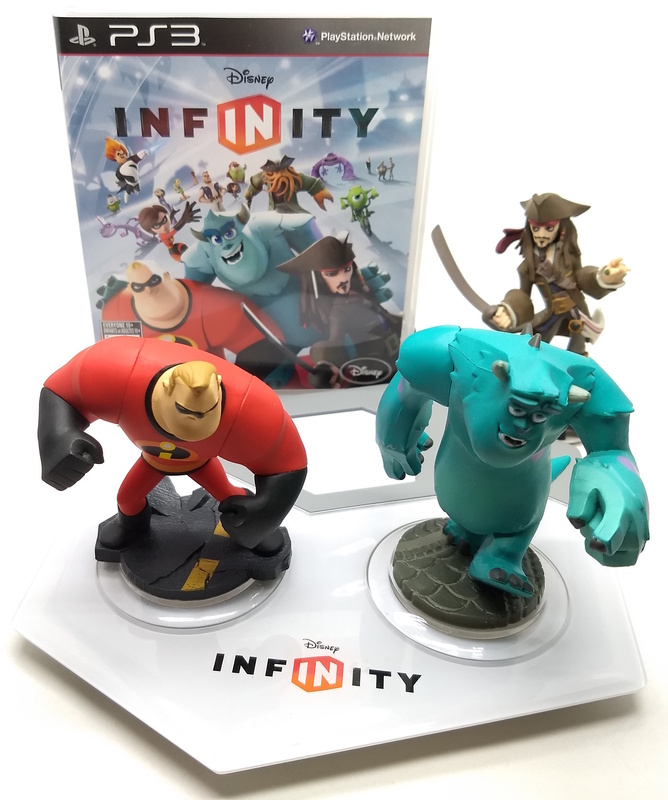 Disney Infinity let you play with characters from many different Disney properties, all together in an open-world sandbox environment called the Toy Box. and various Star Wars play sets. Sequels were released in 2014 and 2015, resulting in over 300 NFC toys, between figures and accessories. 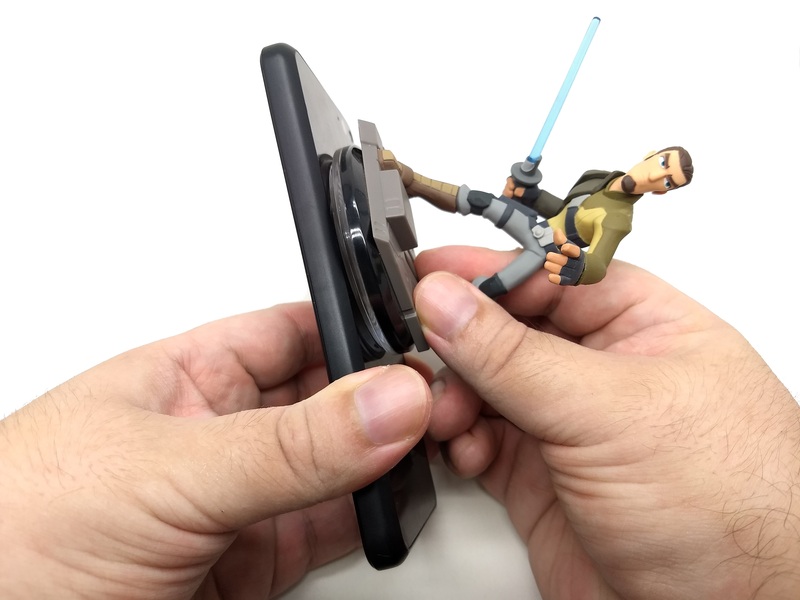 This is a "Kanan Jarrus" figure from Disney Infinity as seen in NXP TagInfo. 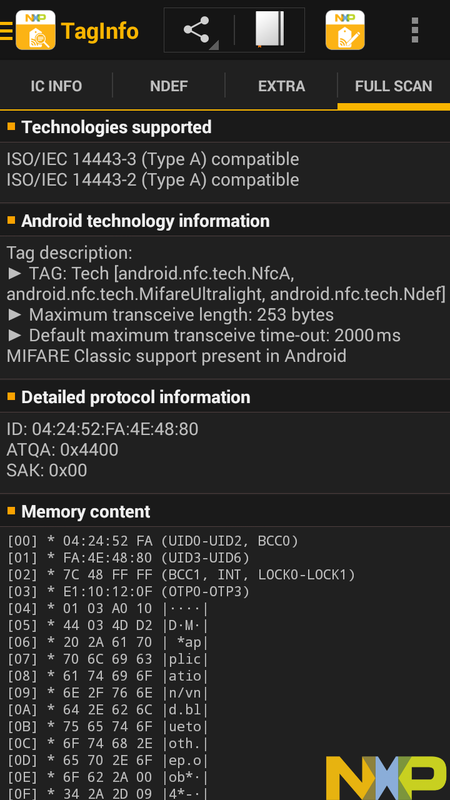 Here, we can see it's an NXP tag, too, specifically a MIFARE Classic (MF1S20) tag. We can see there's 320 bytes total on the tag. We can see its ID, ATQA, and SAK. And we can also see memory content! It's all crossed out, and reports "unknown key." 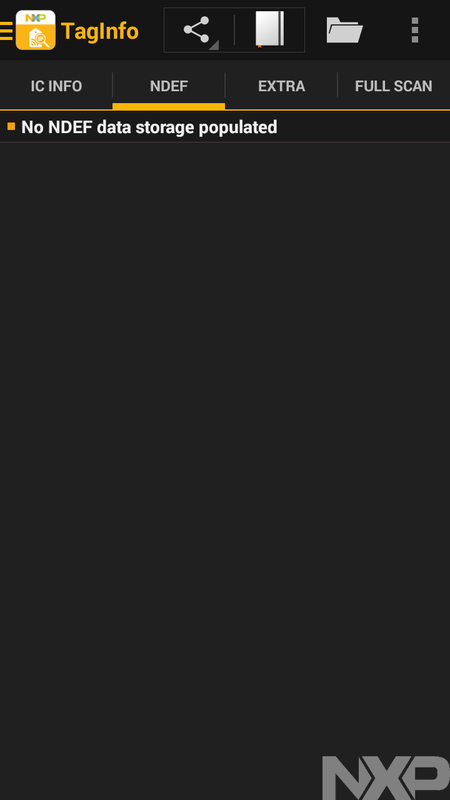 It's like that all the way down, for all 320 bytes. But, at least we can see the structure of the storage on the tag, which we couldn't for the Skylander. 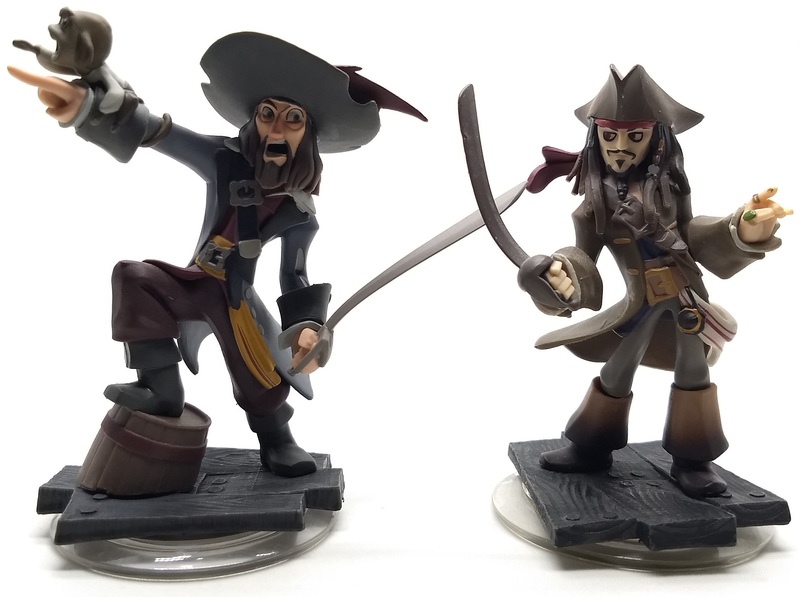 We're less fortunate working with Disney Infinity figures. None of the ten keys are standard keys, so any exploit that relies on knowing a key won't work. 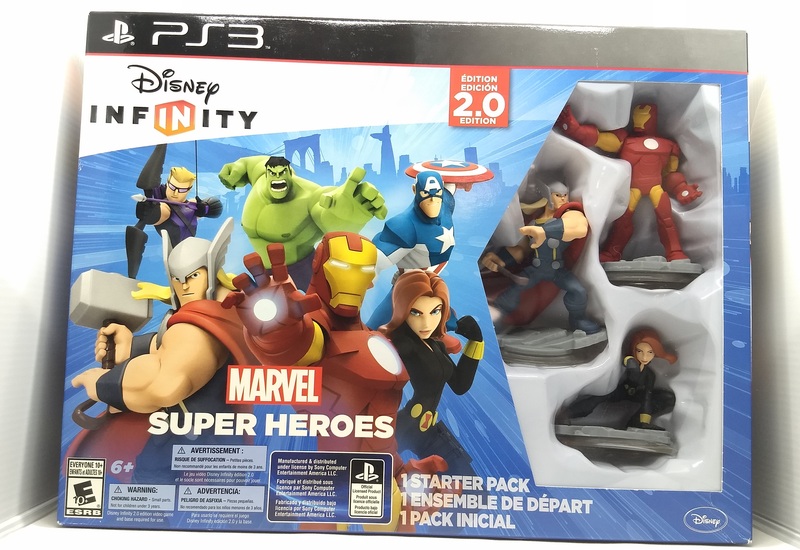 In addition, Disney Infinity came out in 2013, well after NXP hardened the MIFARE Classic. To get into these figures, we're going to have upgrade to the third of three standard tools I'll be discussing: specialized RFID testing equipment. 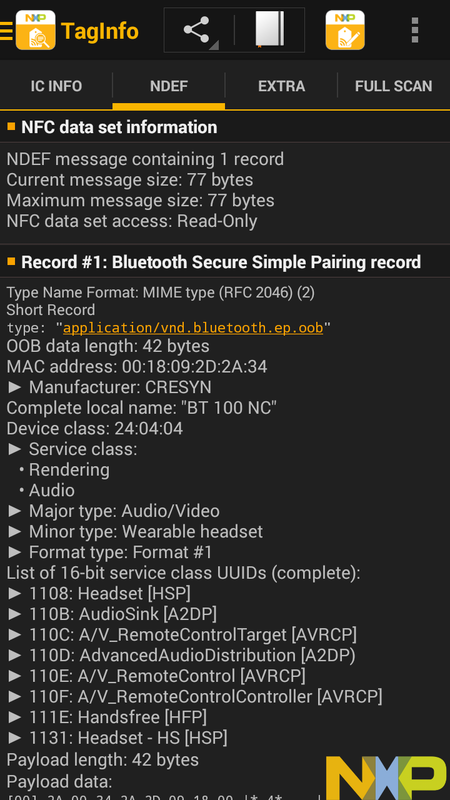 Phones and libnfc-compatible hardware can get you far, but to figure out NFC tags that are password-protected and not exploitable, you'll need to be able to listen in on the wireless communication between the tag and the reader, and that means using more serious hardware. The Proxmark was an open source design for RFID test equipment, providing high-end functionality at a much lower price point than commercial test equipment. 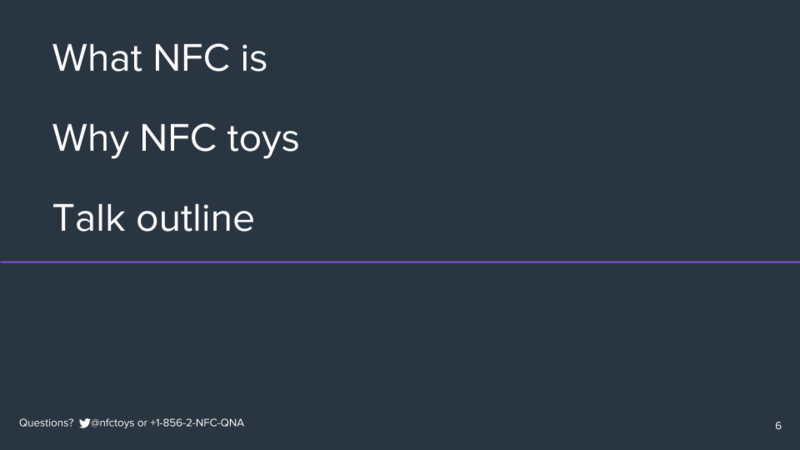 Because NFC is a subset of RFID, it works for NFC toys, too. As specialized RFID test equipment, though, it also requires a more thorough understanding of RFID in general. 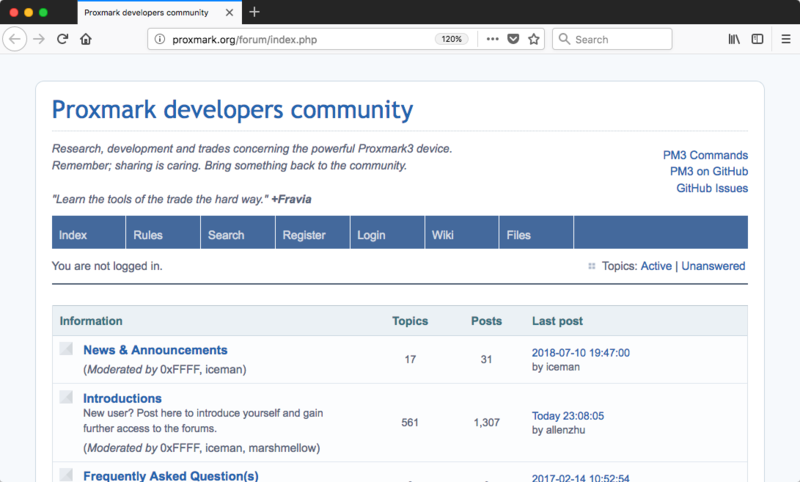 a new Proxmark3 will run $200-400. 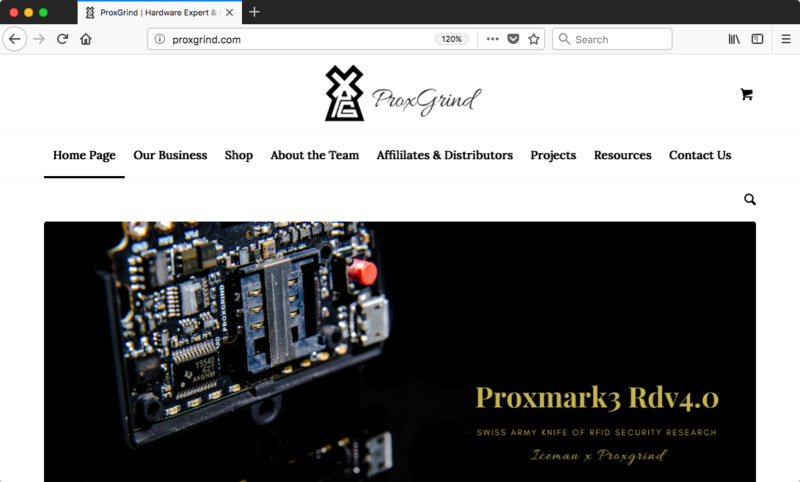 Their community is very active, and it's possible someone has already figured out the tag you're looking at, although you'll need technical expertise to translate something that works on the Proxmark to something that works for a general-purpose NFC reader. 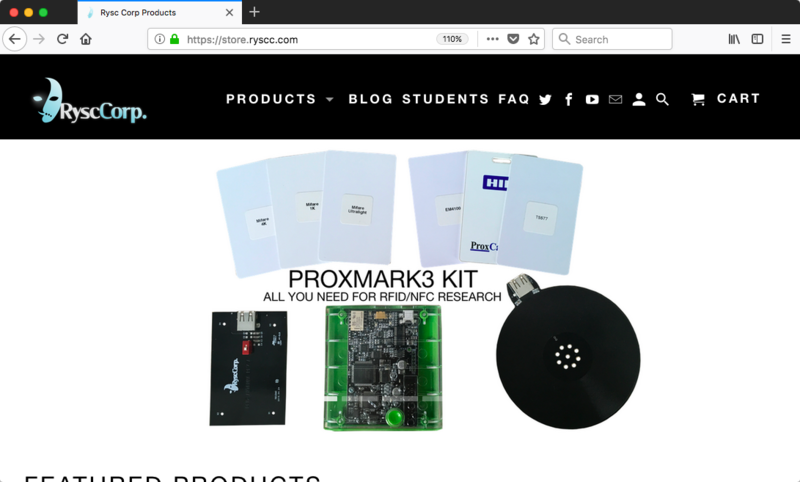 A Proxmark3 will let us place our own antenna right up against the antenna in the NFC reader and the antenna in the NFC toy, and listen in on the communication between the figure and the base. Remember, all of these data transfers are happening wirelessly, over the air, even though the toy and the base are just a few millimeters of plastic apart. If we listen in, we can get the keys. 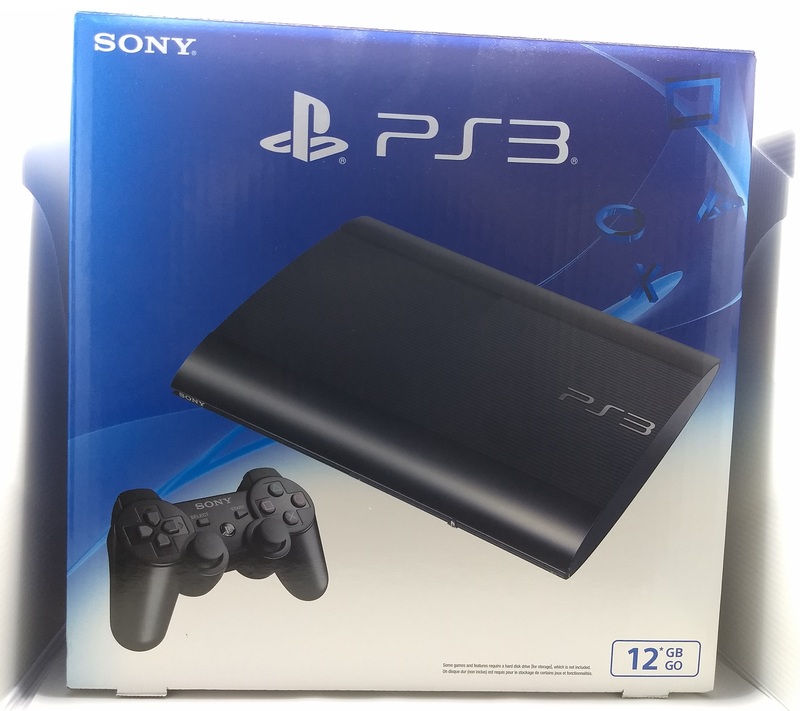 and a console to play it on, since we need the conversation to happen. 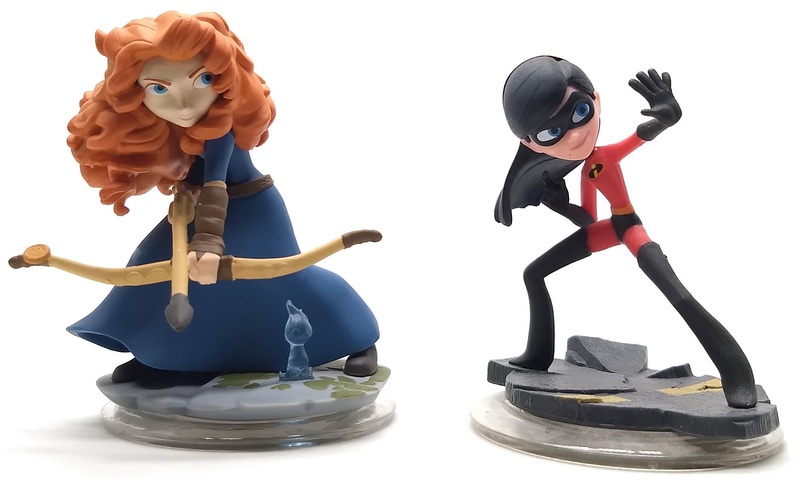 It was possible to get into a Skylanders figure with just a toy, a thesis, and a research paper, but not so for figuring out Disney Infinity. We'll talk about how that affects our risk later. 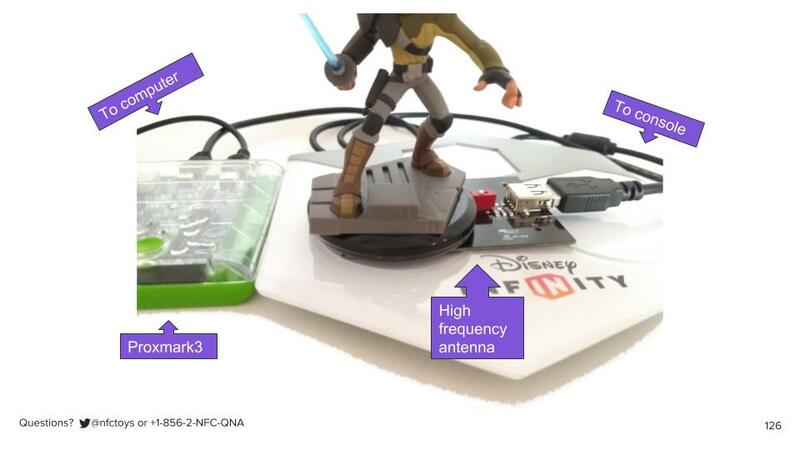 When you have a Proxmark listen in on the toy-base communication, you learn that Disney Infinity NFC toys use one key for the entire toy, both key A and key B for all five sectors is the same. Neither one can be read, so you need to know it in advance. Sector zero is read-only, and sectors 1 through 4 are readable and writable by both key A and key B. Four sectors, three blocks each, means every toy has 192 bytes of storage we can use for our own purposes. The other nice thing about having a Proxmark is it can simulate a MIFARE tag. I don't need to buy a bunch of Disney Infinity toys to get a bunch of keys to see if there are patterns. 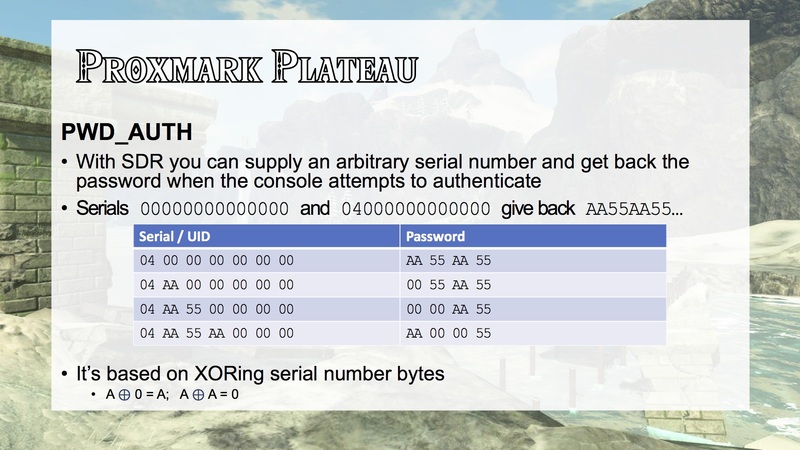 I can have the Proxmark pretend to be a tag with a randomly generated ID, and then have it listen in on what key the base would use for it. And when you do this, for dozens of keys in regular patterns, you find there's no pattern at all. When there aren't any patterns, the only solution left is to reverse-engineer the algorithm by figuring out where it lives, and then extracting it from the software or firmware, and as a liberal arts major, I don't really have the engineering experience for that. along with all other UIDs that had ever been requested, a kind of public UID/key database. 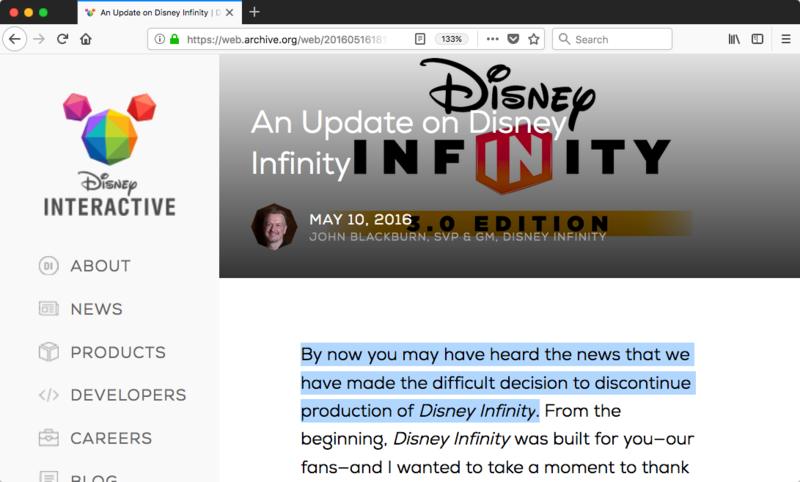 Finally, another security researcher did have the engineering experience, and so today I can present the first, public, clean room description of an algorithm to generate the keys A and B for all Disney Infinity figures released. 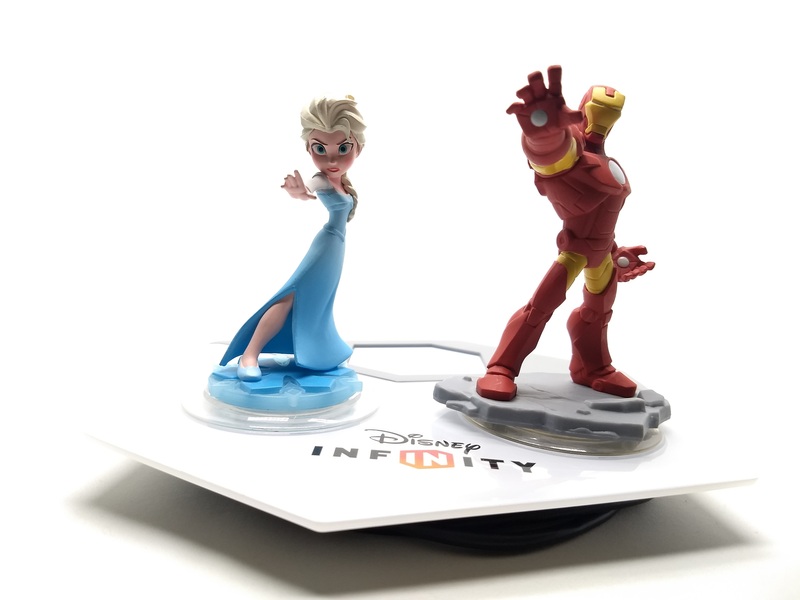 This algorithm supports new interoperability of Disney Infinity NFC toys. 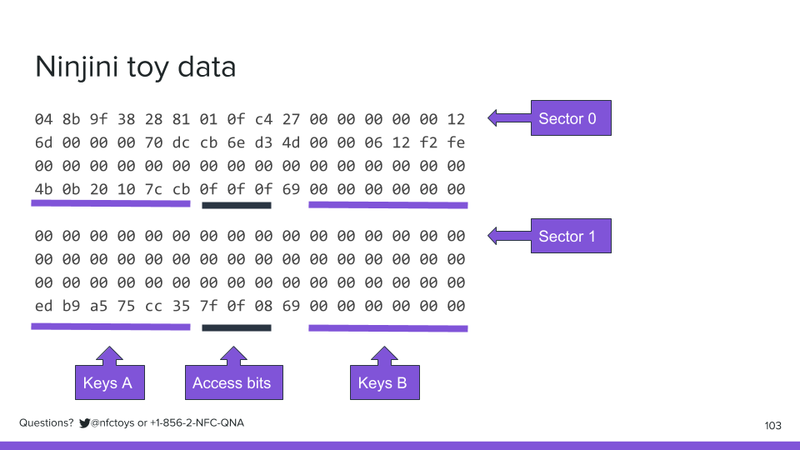 By knowing an algorithm used to set the read/write passwords (keys A and B), we can interoperably read/write our own data to an Infinity NFC toy, using our own NFC hardware and software, without tedious manual simulation and sniffing on a per-toy basis. 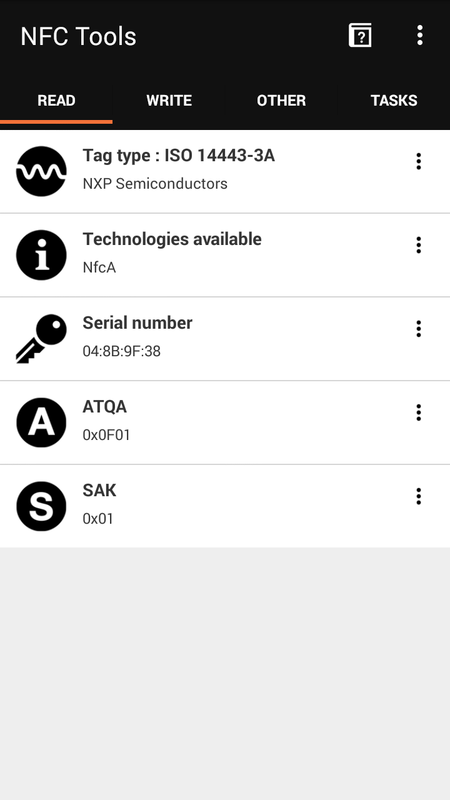 On nfc.toys, you'll find a video showing me writing custom data using a Mac with an off-the-shelf, USB NFC reader, and reading that custom data back out with an Android phone, using a standard app from the Google Play store, NXP TagInfo. 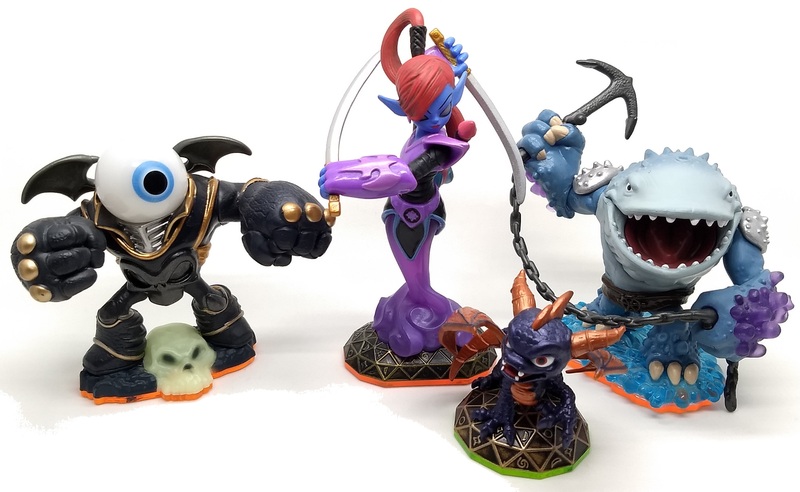 There haven't been any new Skylanders figures in a year, and Disney Infinity was canceled in 2016.
playing cards, and cereal, is still going strong. Same question as before, who has kids who demand regular new Amiibo figures? Who personally collects Amiibo figures? 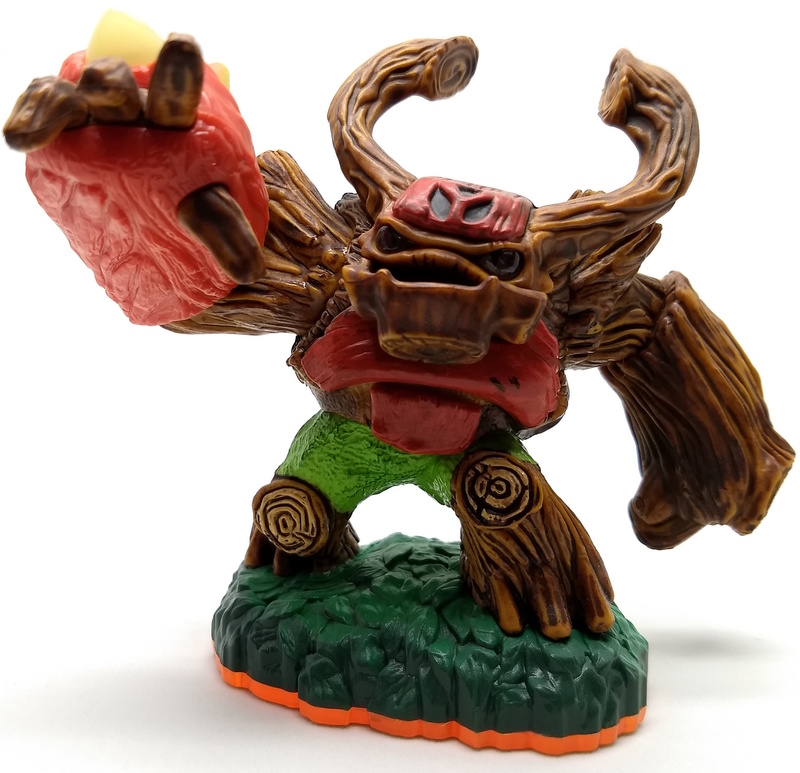 Who has been forced to pirate Amiibo figures, either buying pre-cloned tags, or cloning tags themselves, because the Amiibos you want always sell out before you can get one? For everyone else, Nintendo launched Amiibo in 2014, and in classic Nintendo fashion, treats them as much as rare collectables for obsessive adults as video game accessories for kids, resulting in lines in front of stores on release days, and toys selling out and never being reissued. This is a "Duck Hunt" figure from Nintendo Amiibo as seen in NXP TagInfo. 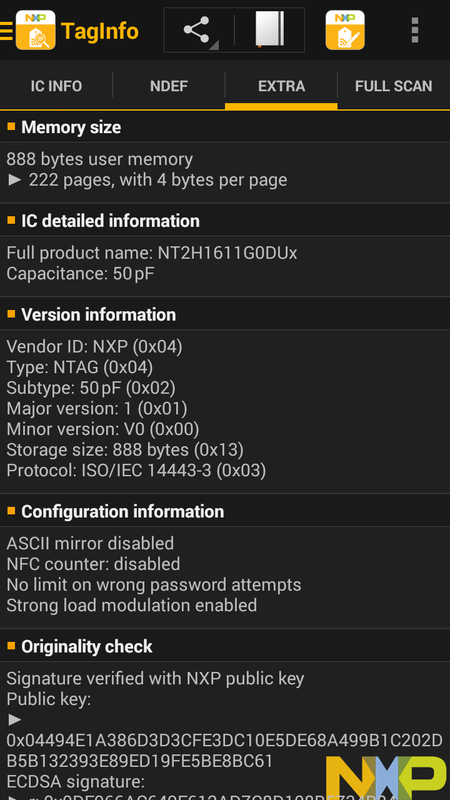 with 504 bytes, made up of 126 "pages" with 4 bytes per page, similar to that pair of Bluetooth headphones. 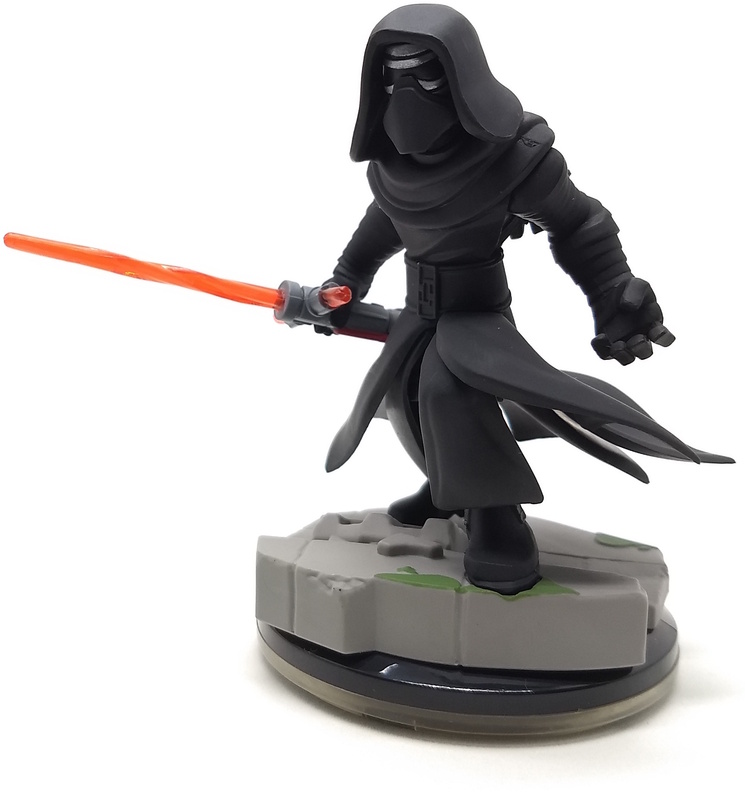 Unlike the Disney Infinity figure, nearly all of the Amiibo is readable, but some of it is marked as "locked & blocked" or "blocked." 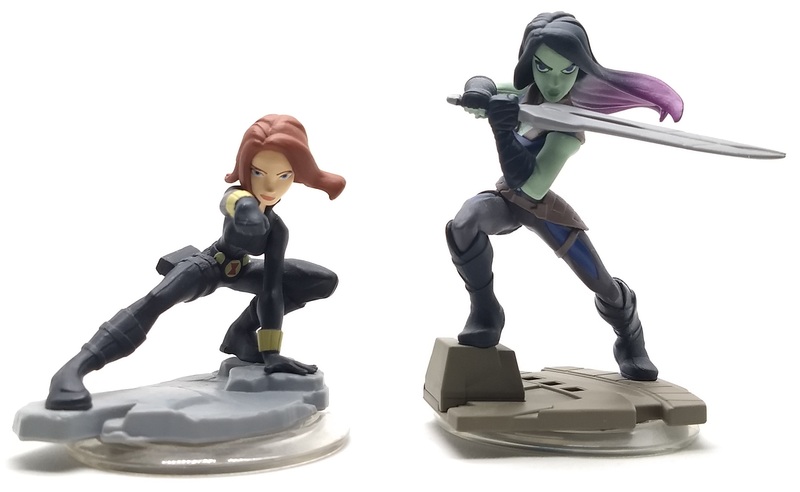 If we were figuring out Amiibo ourselves, we'd have to work it like we did Disney Infinity, but we're luckier here in two ways. and code have been published across the internet since. Second, many of us could probably have independently replicated his work, just like fellow HOPE 2018 speaker James Chambers did. While the Skylanders math was pretty gnarly, the Amiibo math, as presented, is a bitwise exclusive OR operation. It's simple enough that you can do it by hand, with pen and paper, enabling us to write 428 bytes of our own data onto any Amiibo NFC toy. 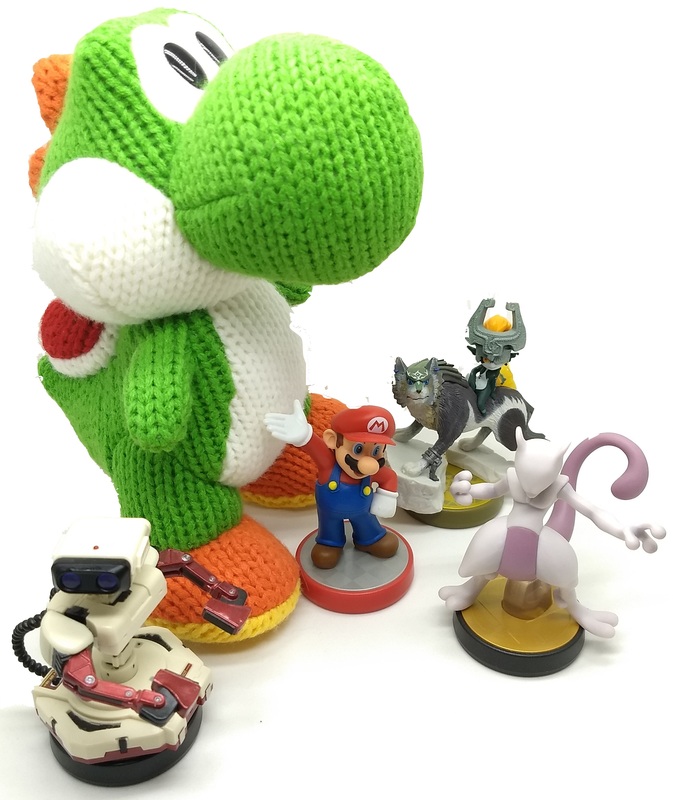 So, today, along with presenting a public, clean room description of an algorithm to generate the PWD for current Amiibo figures, I'm also handing out a worksheet, with an Amiibo card and its UID, so you can generate the PWD by hand yourself, right now, in your seat, if you'd like. 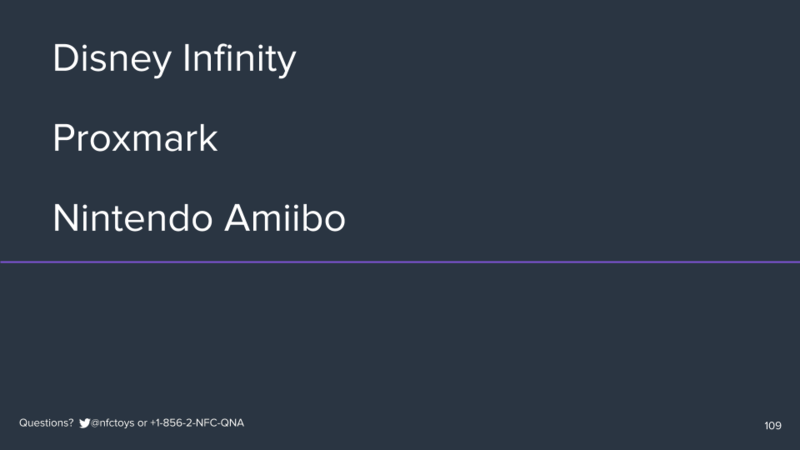 These support new interoperability of Nintendo Amiibo NFC toys. The Amiibo UID is seven digits in hexadecimal, e.g. 04:52:D7:52:01:49:81. 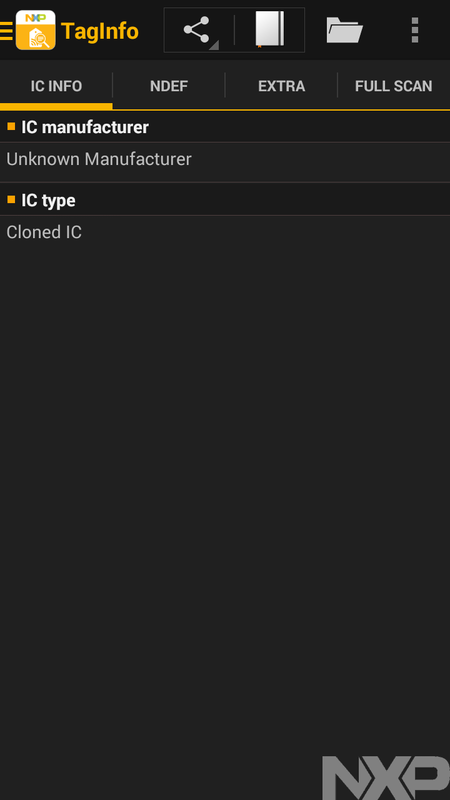 We'll refer to them as UID 0 through UID 6. The resulting PWD is four digits in hexadecimal, e.g. aa:83:b1:d5. We'll refer to them as PWD 0 through PWD 3. 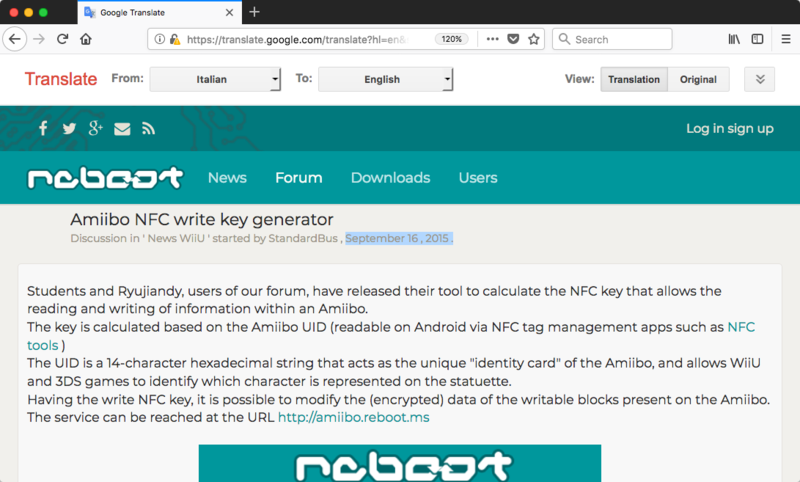 By knowing an algorithm used to set the write password (PWD), we can interoperably write our own data to an Amiibo NFC toy, using our own NFC hardware and software, without needing to compute the PWD by hand on a per-toy basis. On nfc.toys, you'll find a video showing me writing custom data using a Raspberry Pi using an off-the-shelf, NFC add-on, and reading that custom data back out with a Windows 10 laptop, using the open source Google Chrome App NFC Library. Before I hand out the worksheets, though, it's important to consider those legal subtleties I mentioned. Can we get in some sort of trouble if we do this? A few points of order again. I am not an attorney, and this is not legal advice. First, I'm about to talk about legal stuff, but I am not an attorney, and this is not legal advice. 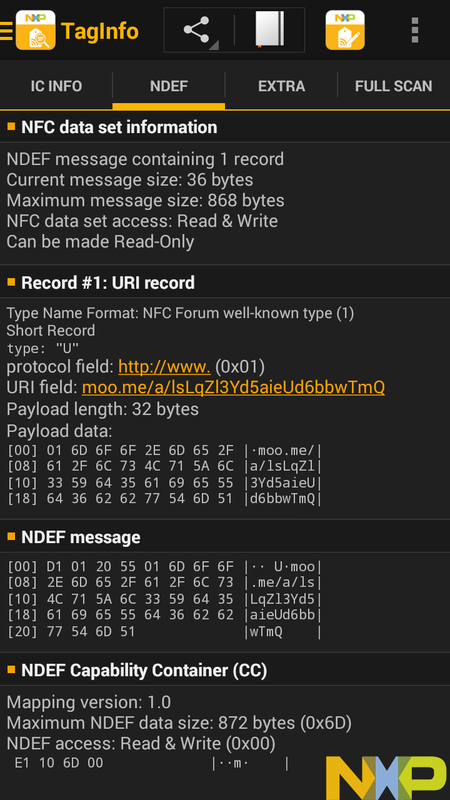 If you intend to publicly discuss or publish your own NFC toy efforts, especially if you explore areas beyond what this talk covers, like data encryption or the USB reader hardware, and you're a US citizen or ever intend to visit the US afterwards, you should talk with an attorney first. Your local bar association can usually refer you to an appropriate attorney, often with a free or reduced-cost initial conversation. Second, this is America, where you can be sued by anyone at any time for any reason, and then you're stuck having to defend yourself. This is lawsuit as threat model. If you can't afford to defend yourself, you should be taking that into consideration. Third, while the next several minutes may be an interesting discussion, at the end of the day, our opinion doesn't matter. Everything we're going to cover is a grey area, and I'll be positioning it as such, because it's things that can only be decided by a judge in a court. some even acknowledged by the companies affected, which actively and directly discuss security compromises in these NFC tags, and am just taking the next steps? The reason is that, legally, some NFC toys may not count as regular NFC tags. Let's define NFC toys in a way that might help clarify this. NFC toys are physical toys which embed NFC tags to support some sort of interaction. The interaction is typically digital, and is important. There are probably toys that embed NFC tags for tracking or anti-counterfeiting purposes, and we just don't know about them. 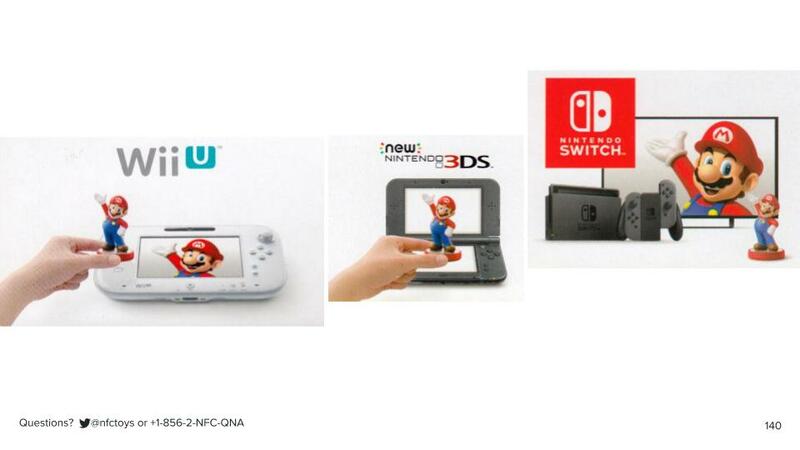 Toys that use NFC to support interactions, typically digital ones, means the toy may contain, affect, or involve digital content, which may be covered by copyright. In 1998, the United States passed the Digital Millennium Copyright Act, or DMCA. Most of you probably know it for section 512, which establishes the "safe harbor" provisions for online hosts. This is when a copyright owner notifies your upstream provider, like your ISP or web host, that you've put their copyrighted content online, and the upstream provider needs to take it down. For the first criminal violation of Title I of the DMCA (§§ 1201, 1202), the maximum penalty is five years’ imprisonment, a $500,000 fine or twice the monetary gain or loss, or both imprisonment and a fine. 17 U.S.C. §§ 1204, 3571(d). For subsequent offenses, the maximum penalty is ten years’ imprisonment, a $1 million fine or twice the monetary gain or loss, or both imprisonment and a fine. It doesn't matter whether you can or do use an NFC toy with the video game it was intended for. That it may be intended to protect copyrighted content is what makes any possible circumvention illegal. So, maybe, let's take this seriously, and see how the DMCA concerns us, based on excerpts from the 2013 Department of Justice Prosecuting Intellectual Property Crimes manual, fourth edition. for commercial advantage or private financial gain. The majority rule in criminal copyright cases for a higher standard of willfulness is also generally consistent with civil copyright cases. The issue arises in civil cases when plaintiffs attempt to recover increased statutory damages, which are available only for willful infringement. 17 U.S.C. § 504(c). Whereas criminal willfulness requires a specific intent to violate “a known legal duty,” civil cases require a more specific intent to violate copyright laws; that is that willfulness is not just an intent to copy, but rather an intent to infringe. "Willfully" has a specific legal meaning, but let's just go with the idea that since you're all in this room, you can't argue that you didn't know it might not be okay for you to do this. Someone who just comes across those clean room algorithms might have a stronger case. In other words, circumvention of an access control occurs when someone bypasses the technological measure’s gatekeeping capacity, thereby precluding the copyright owner from determining which users have permission to access the digital copyrighted work and which do not. Circumvention does not occur, however, by properly using the technological measure’s gatekeeping capacity without the copyright owner’s permission. "a technological measure that effectively controls access"
An access control “effectively controls access to a work” if its ordinary function and operation is to control access to a copyrighted work’s expression, regardless of whether or not the control is a strong means of protection. Significantly, courts have rejected the argument that the meaning of the term “effectively” is based on how successful the technological measure is in controlling access to a copyrighted work. 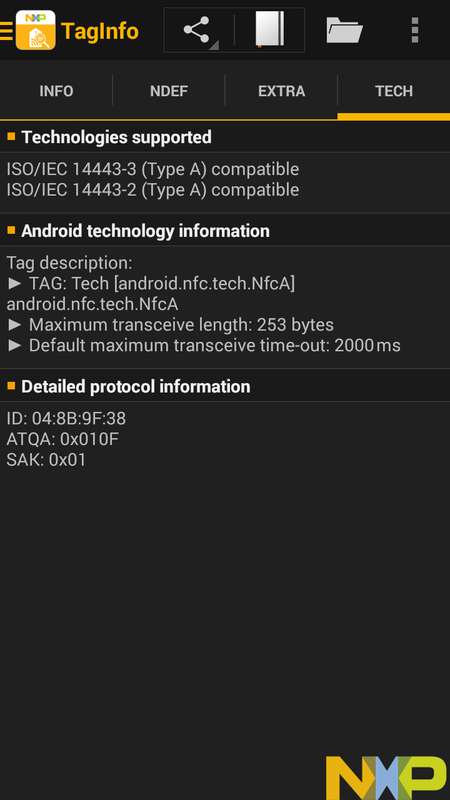 Obviously, an NFC tag's keys or passwords are "technological measures." "Effectively" is a great example of legalese not being plain English, despite sounding like it. "Effectively" does not mean what it does to us in this room, where you're probably interpreting it as something along the lines of "does a good job at." In court, "effectively" basically means "does it exist to do this." The protection of a copyrighted work is an essential element. The DMCA’s anti-circumvention prohibition does not apply to someone who circumvents access controls to a work in the public domain, like a book of Shakespeare, because such a protection measure controls access to a work that is not copyrighted. If we're just just talking about the toy right now, and the existing data on the toy, then if that data is just facts and figures, it wouldn't be copyrighted, and therefore breaking into the NFC toy wouldn't be an infringement. "for commercial advantage or private financial gain." Essentially, a defendant has acted for “commercial advantage or private financial gain” if he sought a profit, financial or otherwise. Whether a defendant actually makes a profit is beside the point: what matters is that he intended to profit. These courts held that the mere purchase and use of such a device [unauthorized satellite and cable television decoders] for the defendant’s own benefit and that of his family and friends does not constitute “gain” within the meaning of that statute. If you're just using these toys yourself, for yourself, there's no commercial advantage or private financial gain. If you're selling keys? Maybe that's an issue? But I'm not being paid to give this talk, and the content on nfc.toys is deeded to the public domain, so I hope that's evidence enough of my lack of profit motive. 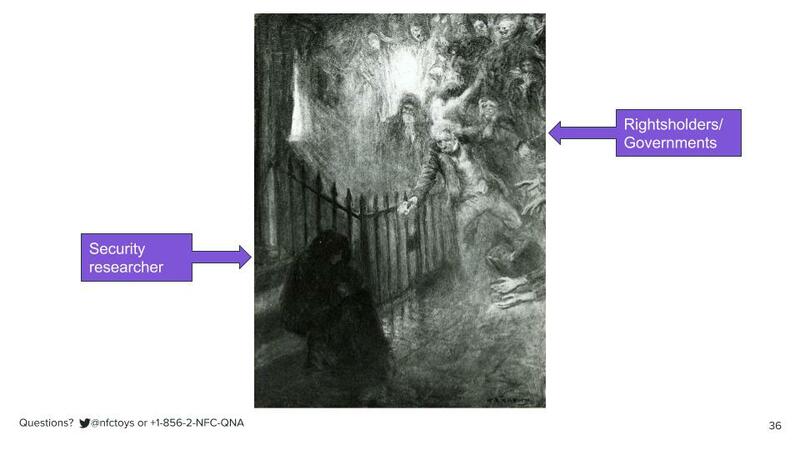 3. a technological measure that effectively controls access (i.e., an access control) Maybe? 4. to a copyrighted work Maybe not? 5. for commercial advantage or private financial gain. Maybe not? 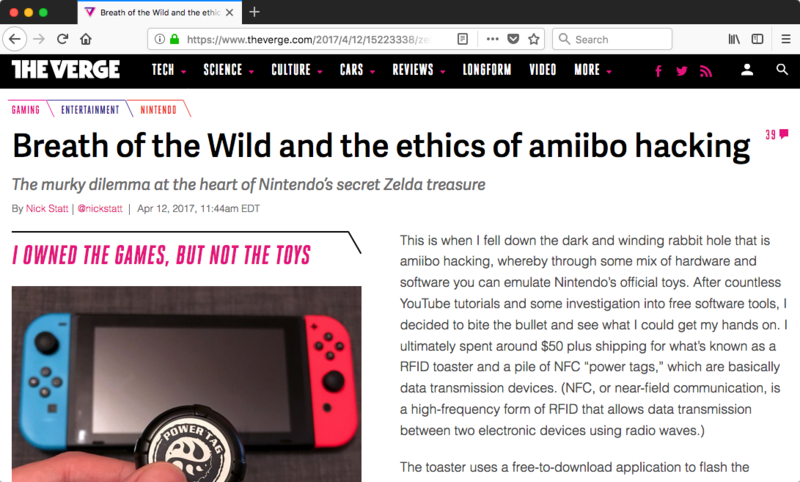 If we're only talking about the toy right now, and only about the existing data on the toy, because we need to tick all the boxes, if the data on the NFC toy is not a copyrighted work, then maybe we're not violating the DMCA, either civilly or criminally! That doesn't mean we can't be sued for this anyway! It just means if we can afford to defend ourselves, we might have a defensible case. If part of our legal standing depends on the data on the toy not being copyrightable, how can we figure that out? Let's start by looking at what copyright protects. A work must be an original, creative expression of an idea or concept, and it must be recorded in tangible form. Thus, copyright law protects a novel or poem written on paper or typed in a computer, a song recorded in a studio or written on sheet music, a sculpture modeled in clay or bronze, or a computer program on a computer’s hard disk. If the data includes things like, the actual character art and sound effects which get used in the game? Those would be original creative expressions. If the data is just "This is a Ninjini toy, with this health and this experience level," those are discrete facts and figures. They're not creative expressions. Facts and figures alone are not copyrightable. So, how can we tell if the data is uncopyrightable facts and figures, or copyrightable content? There's a few ways. Some researchers might reverse-engineer the video game or its support code to understand what data gets read or written. Others might reverse-engineer the encryption on the data, reading it from the tag frequently to see what changes get made. 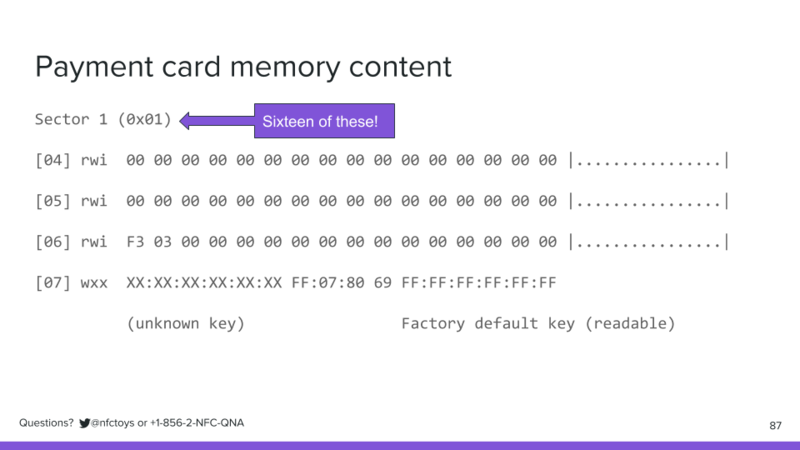 But this is a talk focusing just on the NFC tag in an NFC toy, and it turns out there's a lot we can learn without doing any additional work at all. All we need to do is very carefully play the game, and pay close attention to the tag. 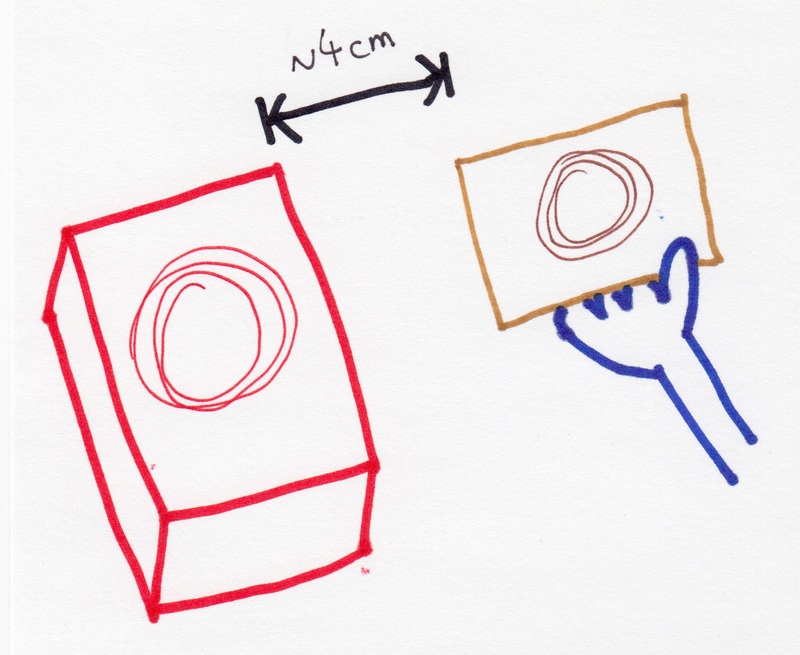 I go into more detail on nfc.toys, but the short version is, we can absolutely collect evidence that there isn't anything original or copyrightable on a figure. Being careful about changing things in game means we can figure out which blocks are likely to store many of our character's variables. The NFC tags in these NFC toys are merely storage devices for numeric and text data that track your character's progress, which can't be covered by copyright. There's one other concern, we touched on it briefly before. Even if we're not circumventing an access control to read and write toy data, the toys are still used to access content within a game, and the game content is almost certainly under copyright. 2. circumvented Maybe not? Maybe not? 3. a technological measure that effectively controls access (i.e., an access control) Maybe? ??? 4. to a copyrighted work Maybe not? Maybe? 5. for commercial advantage or private financial gain. Maybe not? Maybe not? If we're changing #4 to mean "the game content" instead of "the data on the toy," how does that change #3? 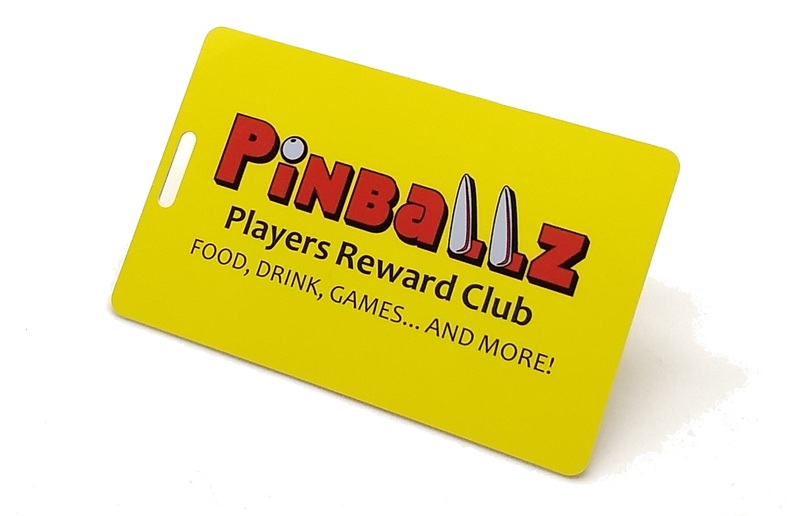 Are the NFC tag keys and passwords effective access controls that protect the game content? I think the additional argument here hinges on that particular legal definition of the term, effectively. That is, the point of the NFC tag keys and passwords isn't to protect the game content, they're there only to protect the data on the tag. 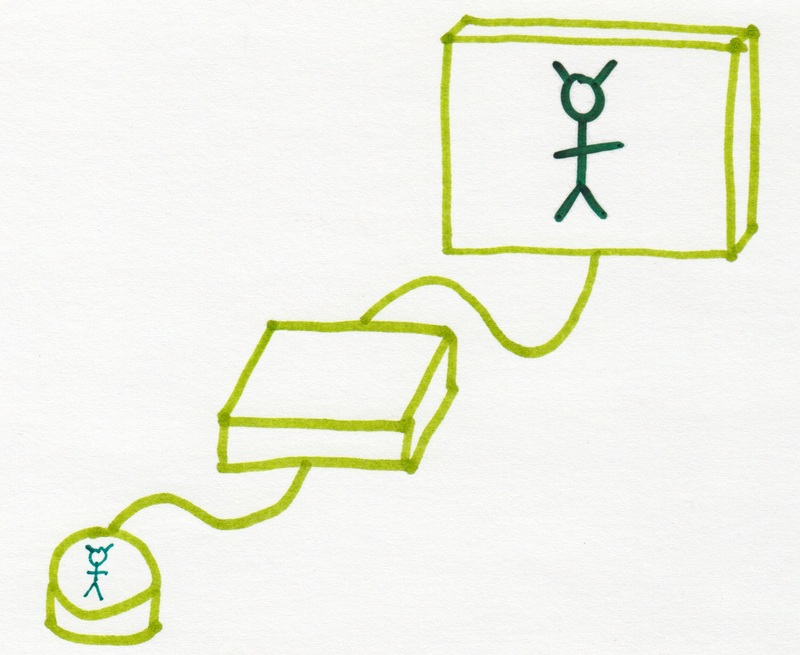 Every NFC toy that controls access to content in a video game requires at least its initial presence on an NFC reader to access that content, suggesting the access control for the game content is the NFC toy as a physical object, in combination with the reader, plus the code in the game, all together. 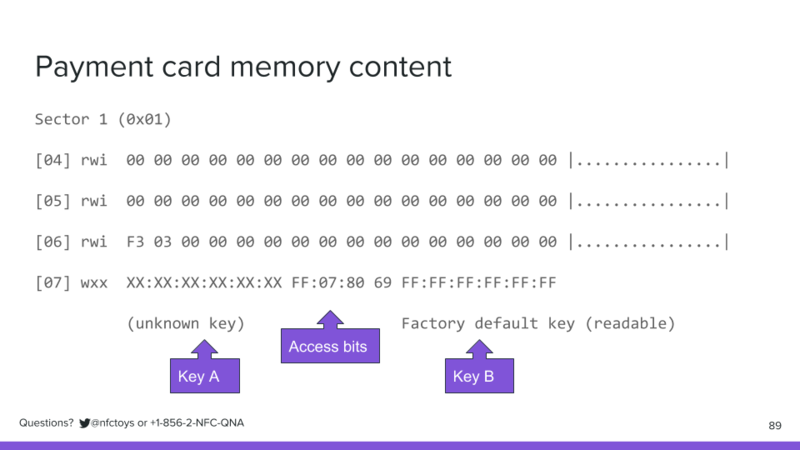 Every NFC toy we've looked at uses keys and passwords in different ways, but they are all able to perform that same function in that same combination, despite those differences. Using a static key for sector zero shows a misunderstanding of the NFC technology. Amiibos don't have read protection. 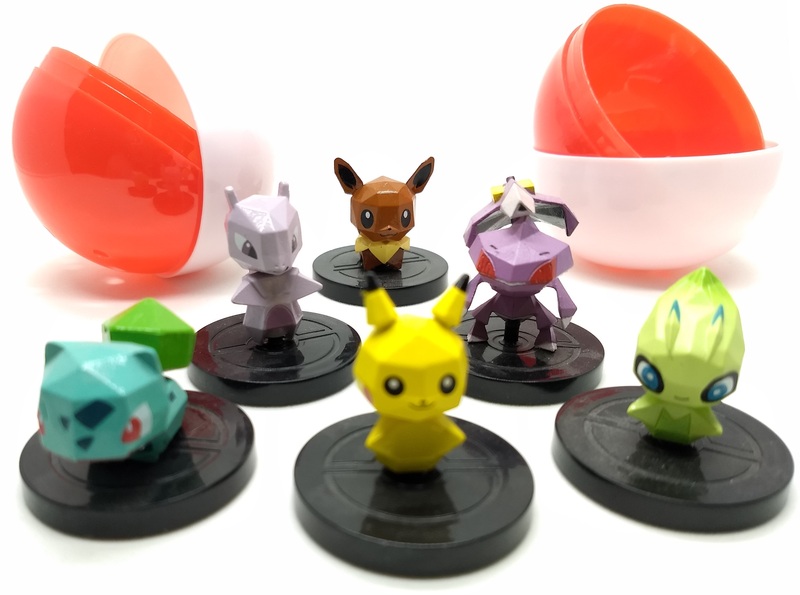 Another toy we didn't even get to discuss, the Pokemon Rumble U figures, don't even have write protection, you can do whatever you want with them right out of the pokeball. This suggests that the NFC tag keys and passwords aren't "effective access controls" for the game content; they don't exist to have any affect on access to the game content if they can be misunderstood or not used at all. They are simply there by virtue of arbitrary technical decisions to make it easier or harder to work with the toys as data storage devices. So, maybe #3 is a "maybe not." 3. a technological measure that effectively controls access (i.e., an access control) Maybe? Maybe not? We talked about NFC toys, which are toys, which have NFC tags embedded in them. We talked a little bit about them, about the toys-to-life genre of video games, and about NFC tags in general. We talked about various off-the-shelf hardware and software you can use to explore these NFC toys, how that exploration can lead to determining read/write credentials, and how to write your own data to three different types of NFC toy. Finally, we talked about the legal implications of doing so, and I have hopefully established that using NFC toys for your own data storage is probably not circumventing an effective access control, is probably not a copyright infringement, and that this work is legally enabling new interoperability of NFC toys with your own hardware. I am not a lawyer, and this was not legal advice. While I discussed legal matters, I am not a lawyer, and this was not legal advice. So, who believes that obtaining credentials for an NFC toy is legal, and wants to assert their right to do so? Raise your hands. 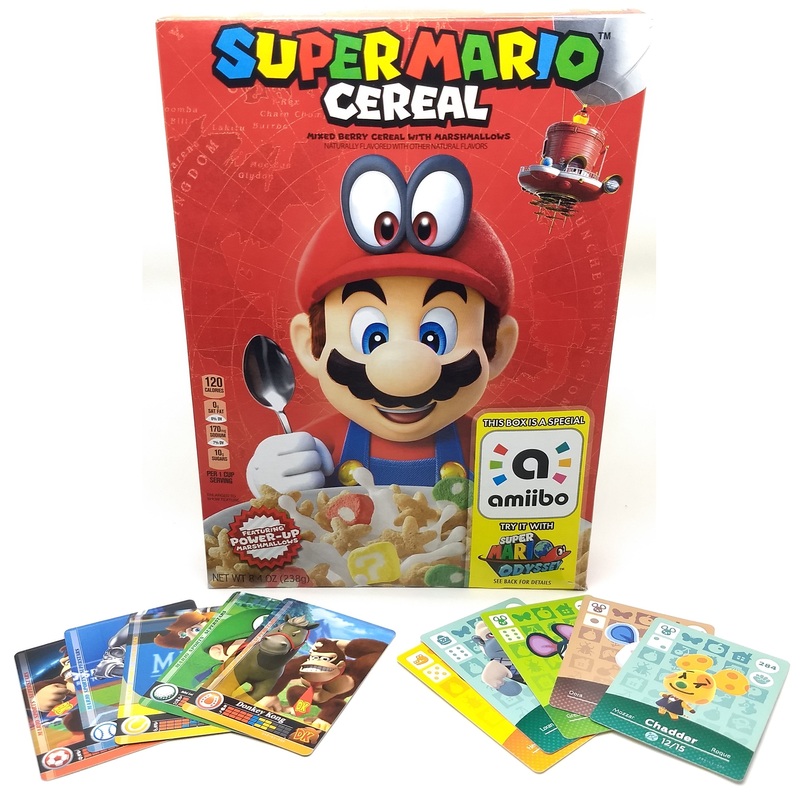 These are Amiibo cards, each card has an Amiibo NFC tag inside. Clipped to the card is a worksheet which explains how to compute the PWD for the Amiibo card longhand, I hope you'll enjoy working through it. 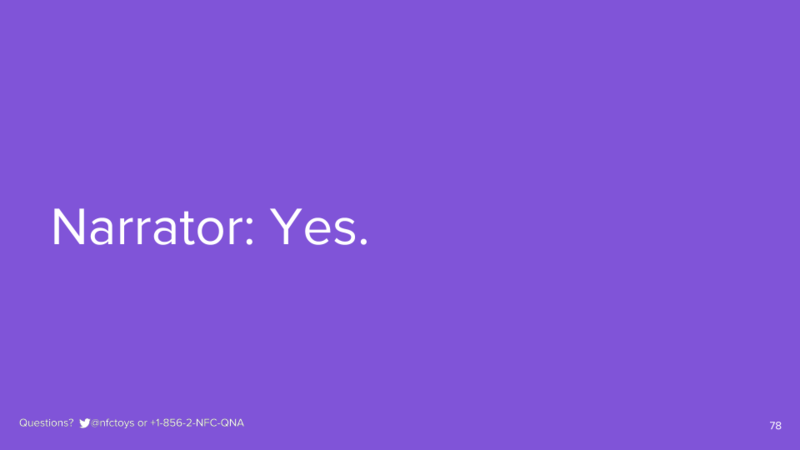 That's it for my talk, we don't have time to do Q&A, but I'll reply on nfc.toys to any questions submitted. Please fill out your feedback forms, and pass them forward or hand them to me as you exit. Thanks so much. Most references are linked inline. See the colophon for image attributions and credits. The photo in slide 9 is by Matt Biddulph. I am a huge fan of his work going back to Reinventing Radio at BBC R&D, and I am right chuffed that this photo is a) his and b) just what I needed. 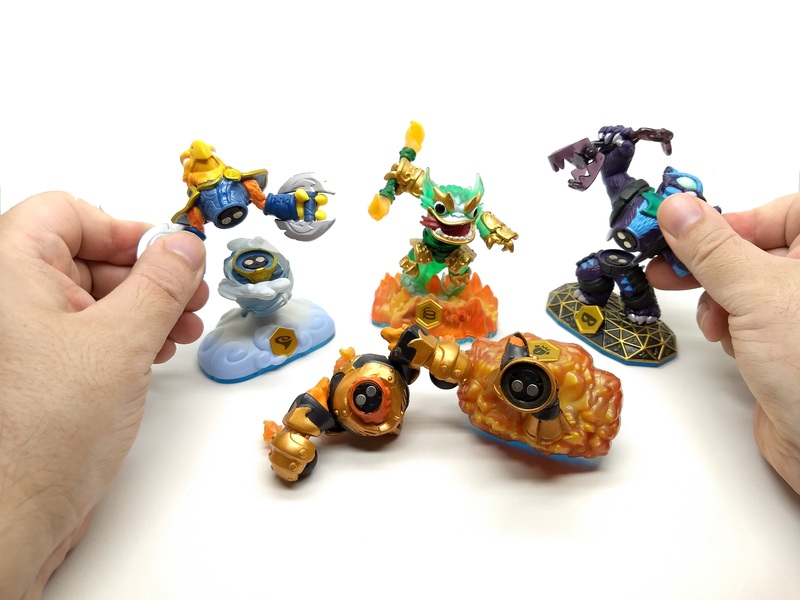 The NFC tag in slide 10 and 14 is from a Skylanders "Bash" figure, the same tag and toy seen disassembled in slides 34 and 181. 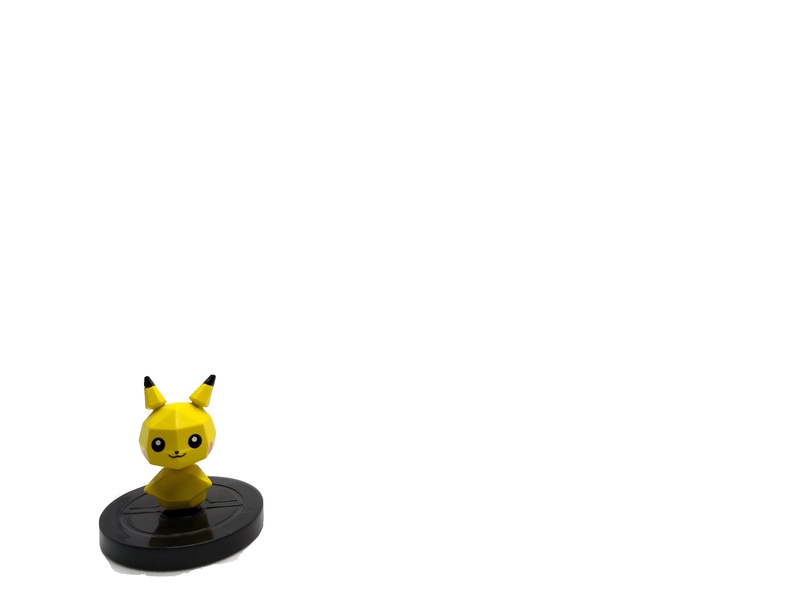 Slide 15's toys are Pokemon Rumble U figures, Nintendo's pre-Amiibo NFC toy from 2013. Slide 16's toys are Star Wars Force Link, a series of action figures, vehicles, and playsets. You wear a wrist gauntlet which detects the NFC tags and plays sound effects appropriate to the character and/or its location in a play set. 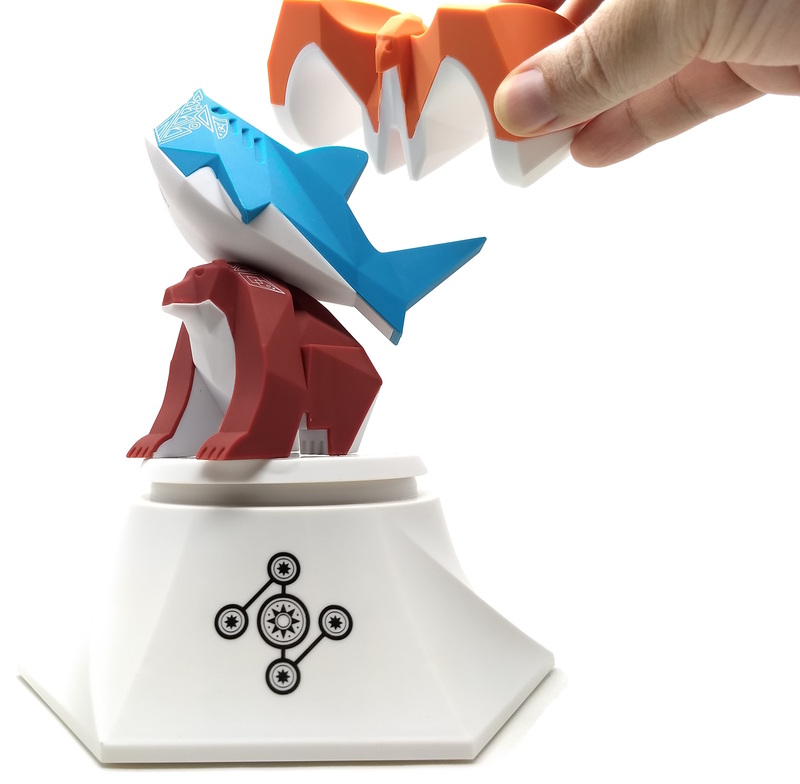 Slide 17's toys are Beasts of Balance, a connected tabletop game. The stand is an NFC reader and digital scale which connects to a tablet over Bluetooth. Slide 33's toys are Lego Dimensions, a toys-to-life video game where assembling and re-assembling the portal and the figures' accessories is part of the gameplay. I am indebted to the hobbyists and researchers who went before me, and to everyone who publishes their notes, their documentation, and their software for others to learn from and build upon, but especially the Proxmark community, Adafruit's NFC and MIFARE explainer and the RFIDIOt Python library. For answers to questions submitted during the conference presentation, see the Q&A page.